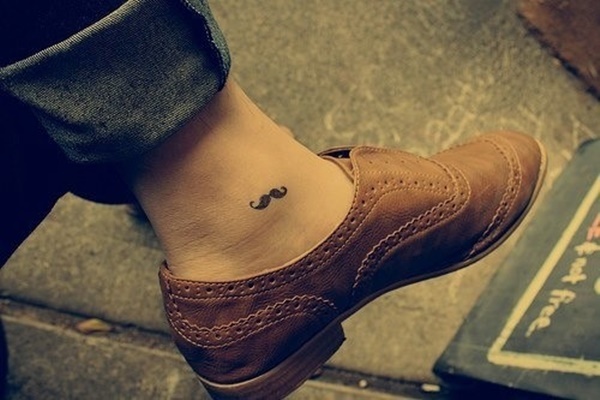 This article compiles one hundred images of ankle tattoo designs for men and women. You will find a varying source of subject material and explanations behind popular images and styles. Whether you are deciding on a piece for yourself or just appreciating art, you will find this list to be equal parts entertaining and informative. 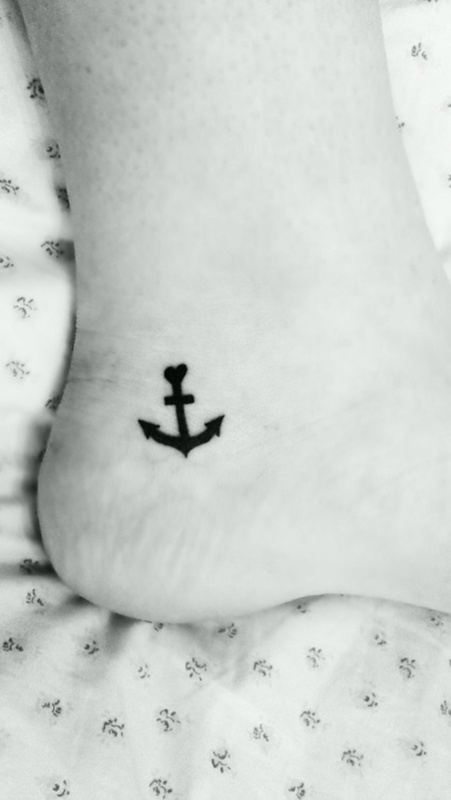 Traditionally, the anchor is associated with Navy sailors. 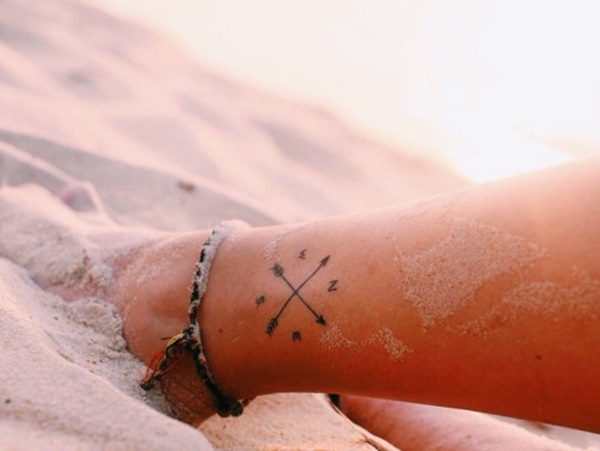 Sailors helped popularize tattooing in western culture and many of their favorite images are prevalent in modern tattoos. While the anchor typically has a masculine association, this piece offers a touch of femininity by adoring the anchor with a bow and a heart shape. 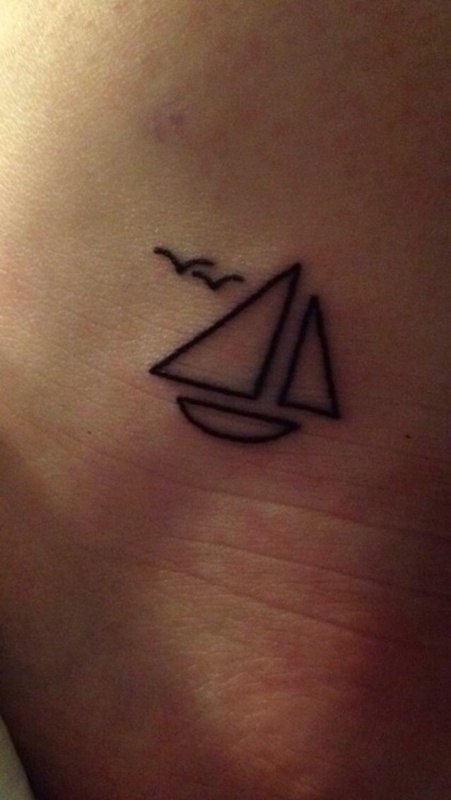 The concept of this tattoo confuses me. 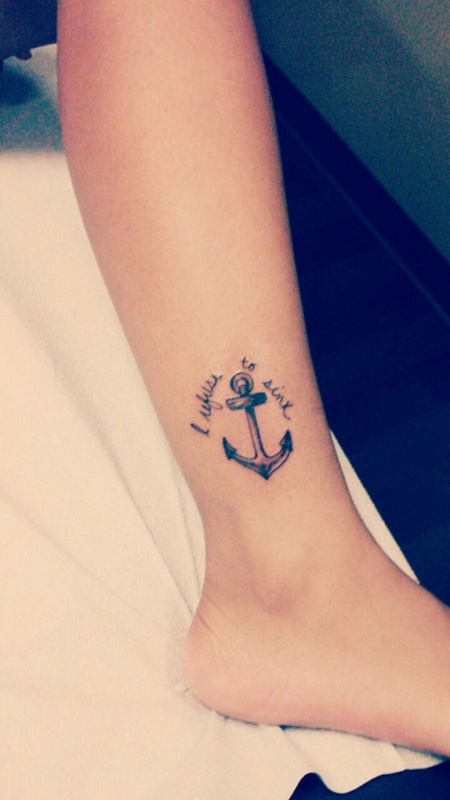 An anchor is designed specifically to sink, therefore an unsinkable anchor is more so a symbol of worthlessness. If the wearer was looking for an appropriate visual representation of her unwillingness to sink, a buoy or life raft seems like a more logical choice. 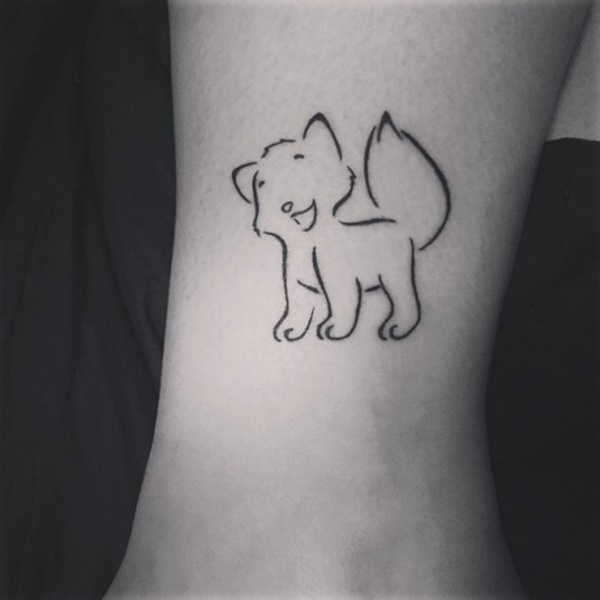 A simplistic tattoo depicting a brightly colored fox in a cartoon style. 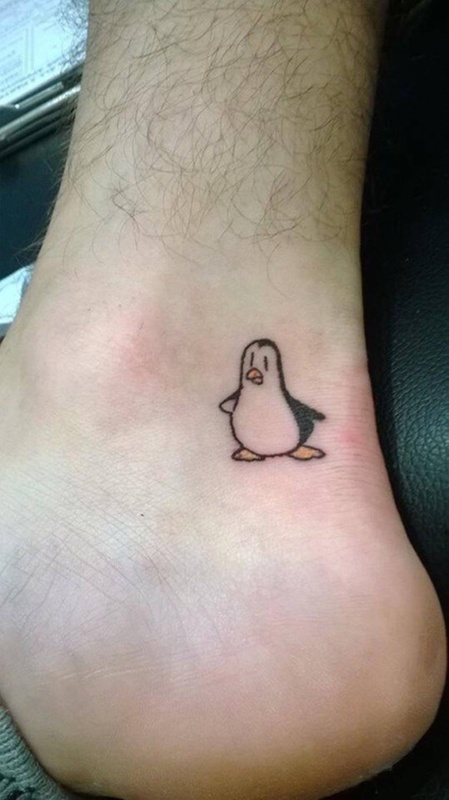 While this article is geared toward tattoos for women, this man is comfortable enough in his masculinity to have an adorable penguin tattooed on his ankle. Cuteness knows no gender. 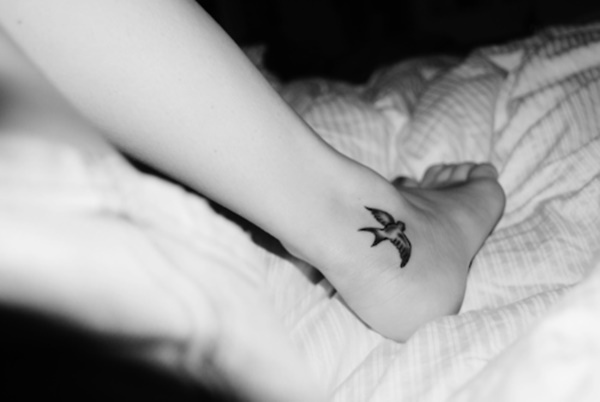 Greek mythology spoke of a pair of winged sandals that gave the wearer the swiftness of a bird. 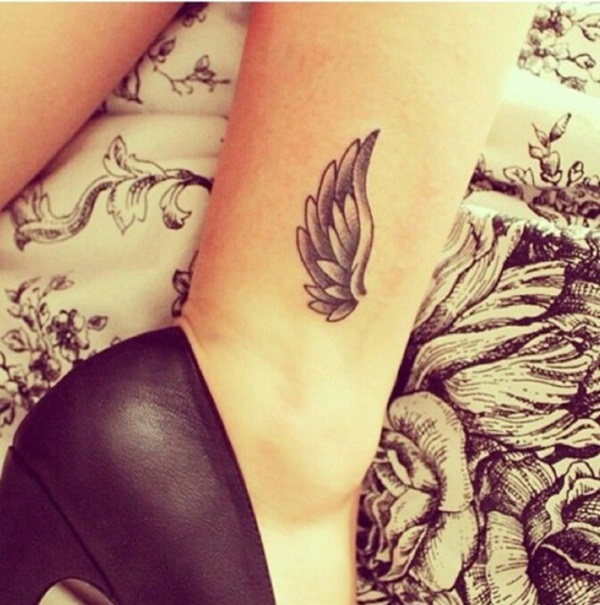 Here we see a wing tattooed behind the ankle bone in homage to the myth. 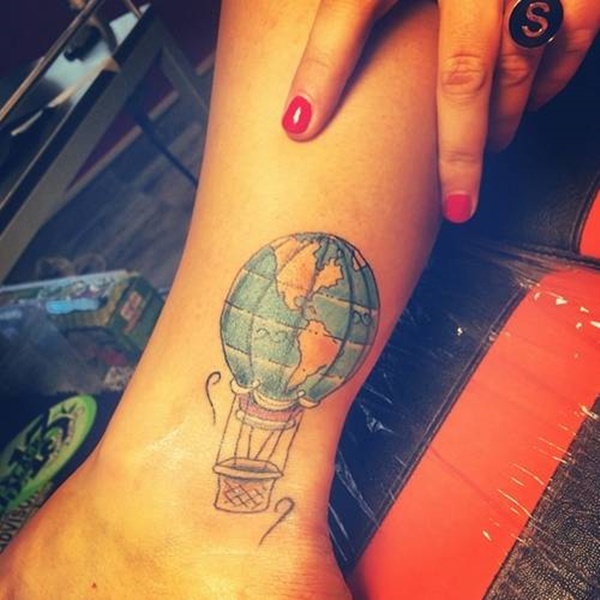 A globe replaces the balloon of a hot air balloon. The squiggly lines on the side are supposed to indicate the balloons ascension. 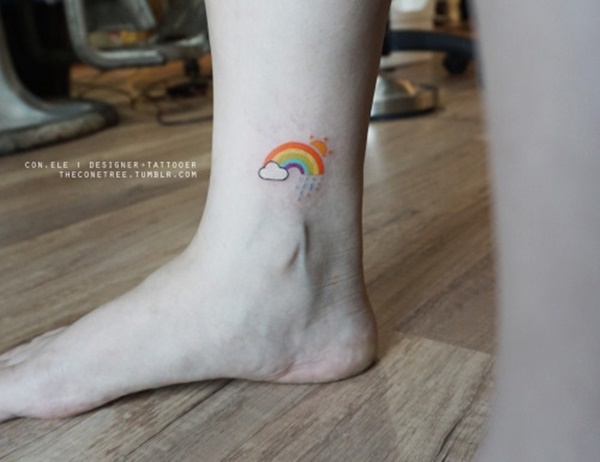 A simple, cute, and colorful tattoo depicting a rainbow, cloud, sun, and rain. 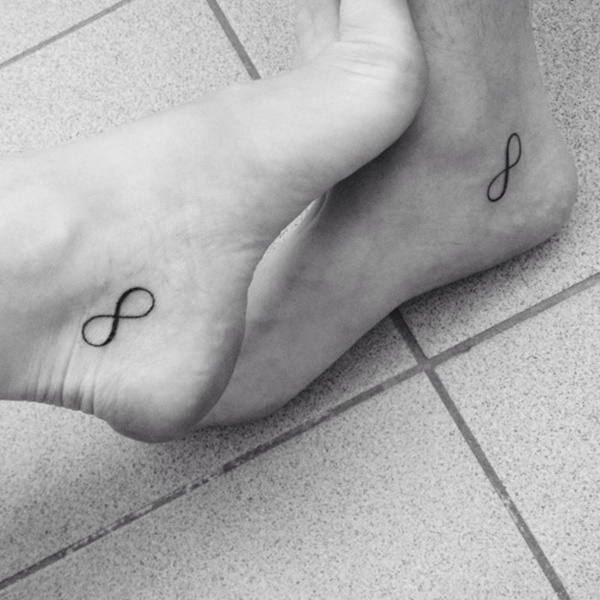 Lay an eight on its side and you have an infinity symbol. Slightly more intricate designs exist where the lines in the middle visibly overlap. Musical notes and staffs are arranged into the shape of a heart. A unique and creative take on a popular image. 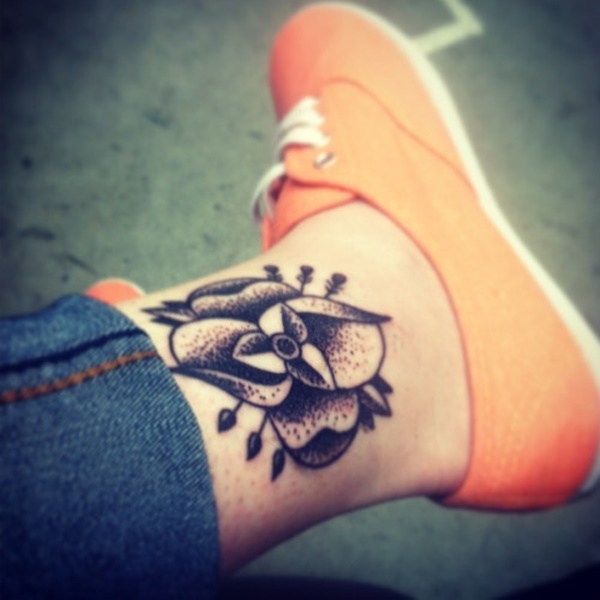 A flower comprised of bold black lines and devoid of shading or color. 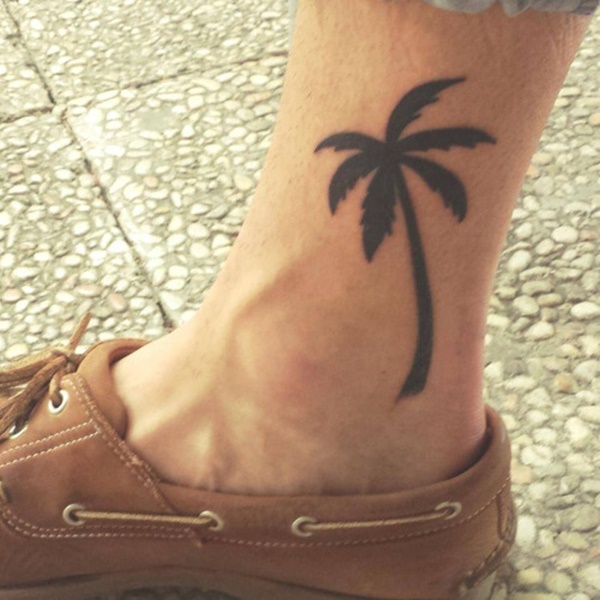 Ideal for anyone who loves tropical climates this tattoo shows the silhouette of a palm tree above the wearer’s ankle. A stylized depiction of two cute, cartoon cats that compose the shape of a heart. 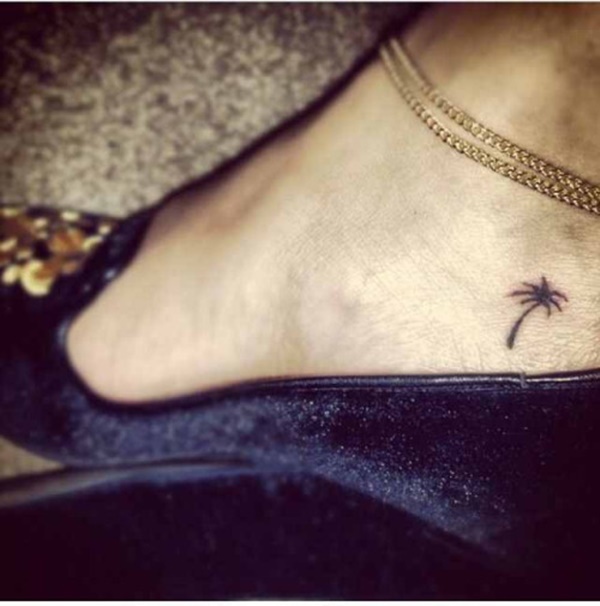 A smaller version of the tattoo seen earlier in the article; a bold black silhouette of a palm tree. 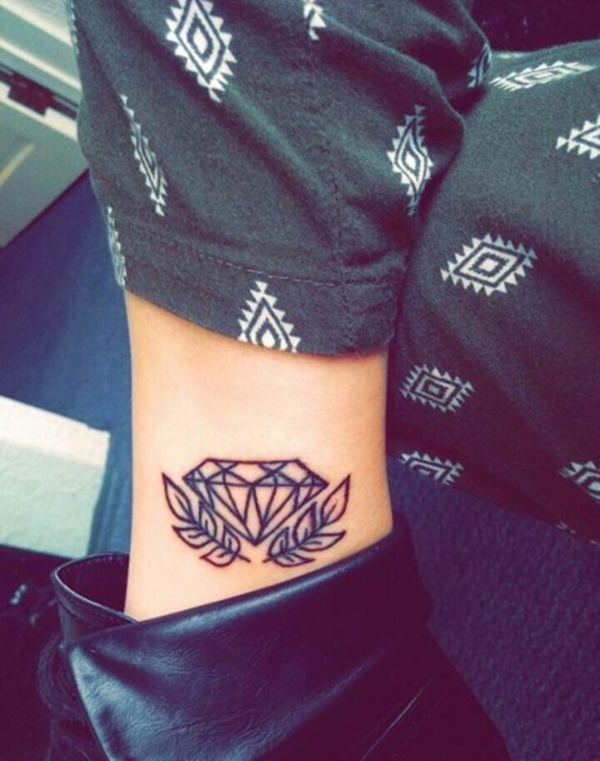 This tattoo uses bold outlines to create a diamond framed by a wreath. 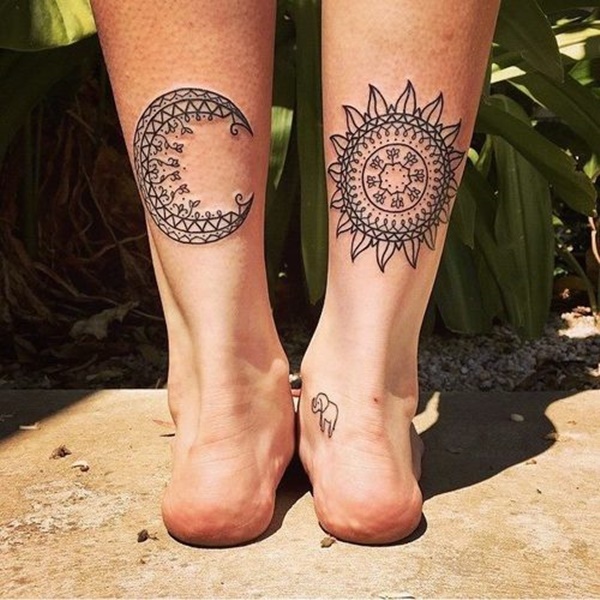 Here we see a sun and moon decorated with an Indian mandala pattern. 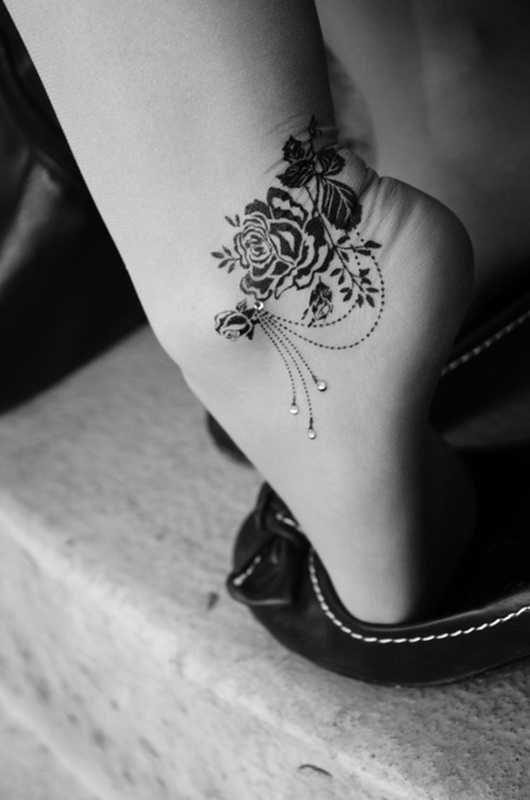 An elephant, a prevalent symbol in Indian culture, is also pictured on the wearer’s right ankle. A sun is shown with a face in the middle and the rays extend into stylized shapes reminiscent of leaves. I can’t place the exact character being depicted in this outline but the image is very familiar. 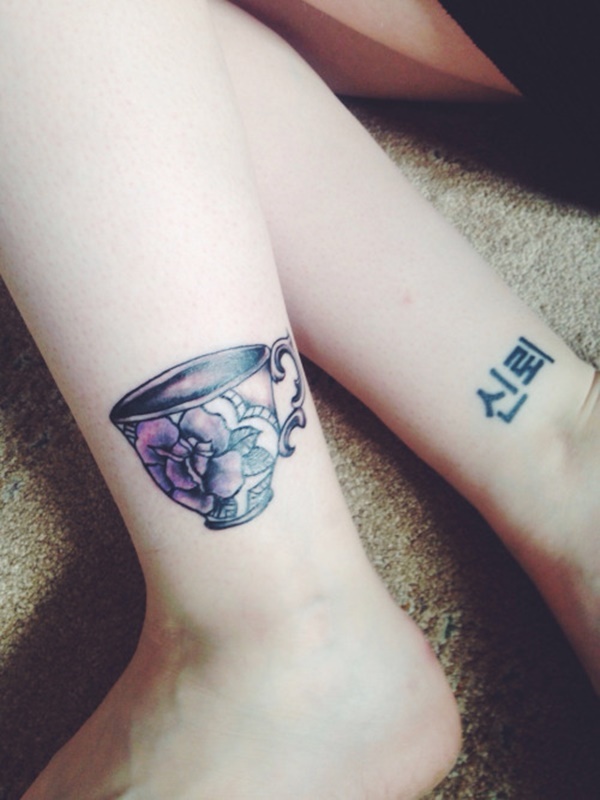 An ornate tea cup adorns one ankle while, what I believe are Korean characters, adorn the opposite ankle. Bold outlines and intricate details clearly convey a pair of daisies as they begin to wither. 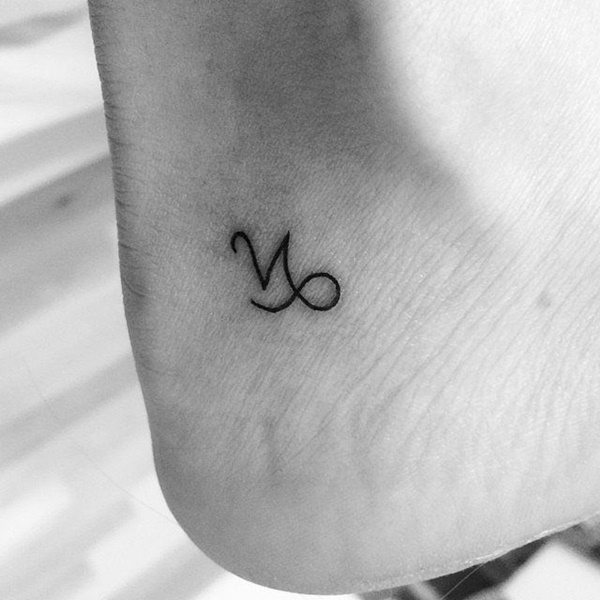 A bold, black tattoo picturing the horoscope symbol for Leo. A skull is embellished with designs and flowers reminiscent of the decorations popular during the “Day of the Dead” in Mexico. 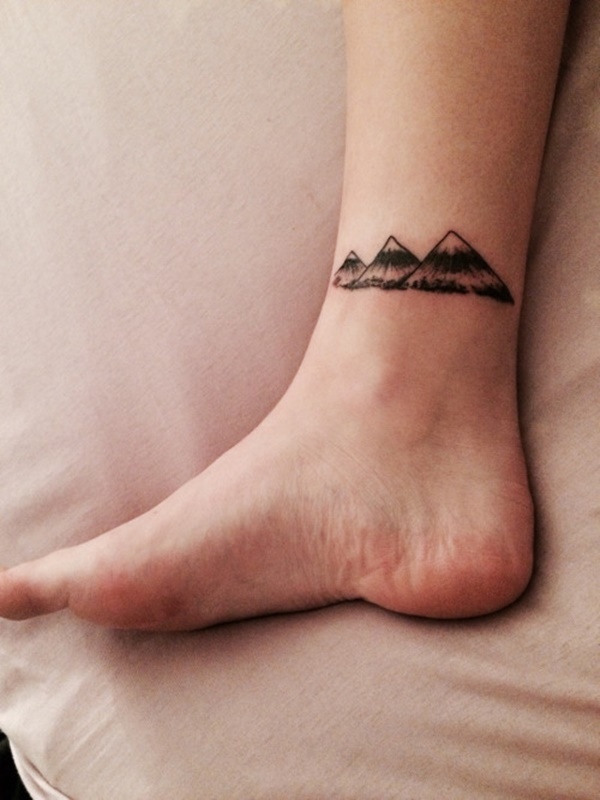 A series of three snow-capped mountains are depicted in a minimalist black and grey style. 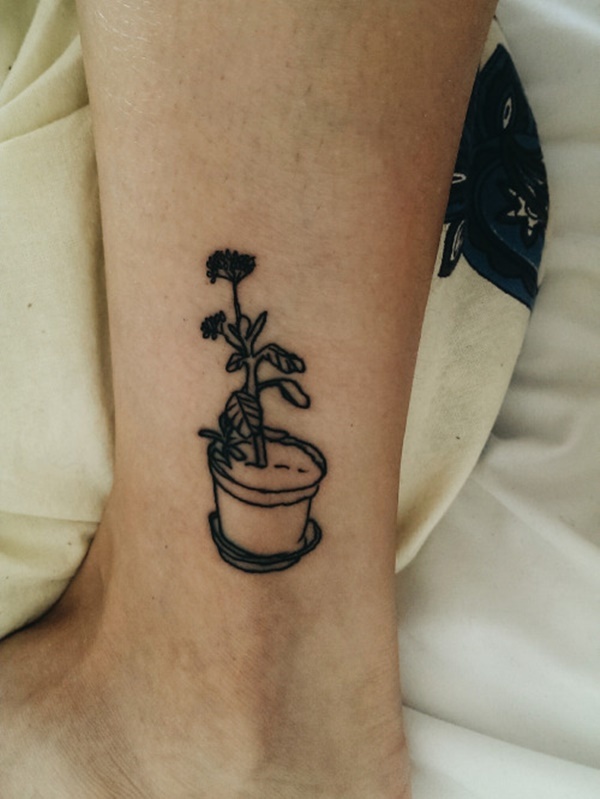 There seems to be a strange correlation between ankle tattoos and dying plants. Here we see a house plant that is in desperate need of care. A silhouette of a hand making the symbol synonymous with rock is detailed with a heart in the palm. A super simple representation of a sail boat accompanied by a few flying birds. When dealing with small tattoos less details make for a clearer image and an easier job for your artist. 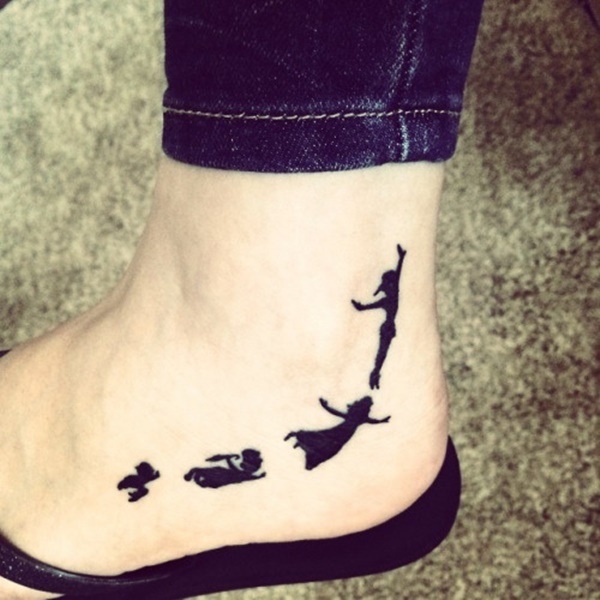 A silhouette showing Peter Pan being followed by the lost boys as they fly upward. I am genuinely impressed the intricate details contained in this small scene depicting and Asian village. Every building and person is clearly defined with the use of shading and contrast. A remarkable piece and a testament to the talent of the artist. 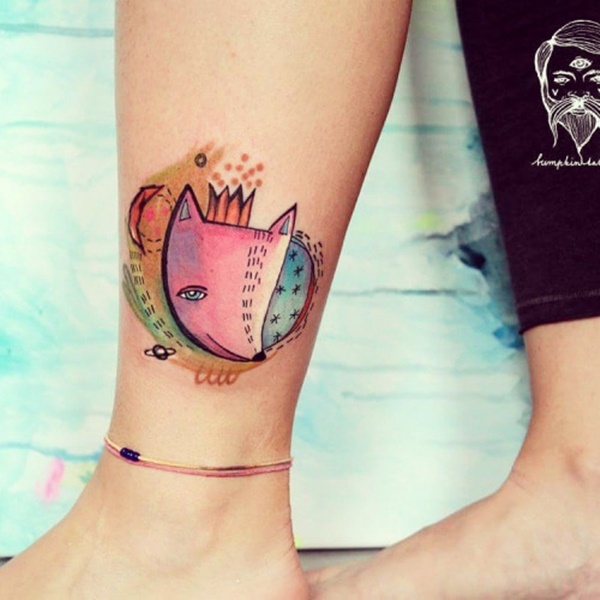 Two brightly colored mandalas are pictured on the ankles of this wearer. Mandalas are a beautiful image with or without color. 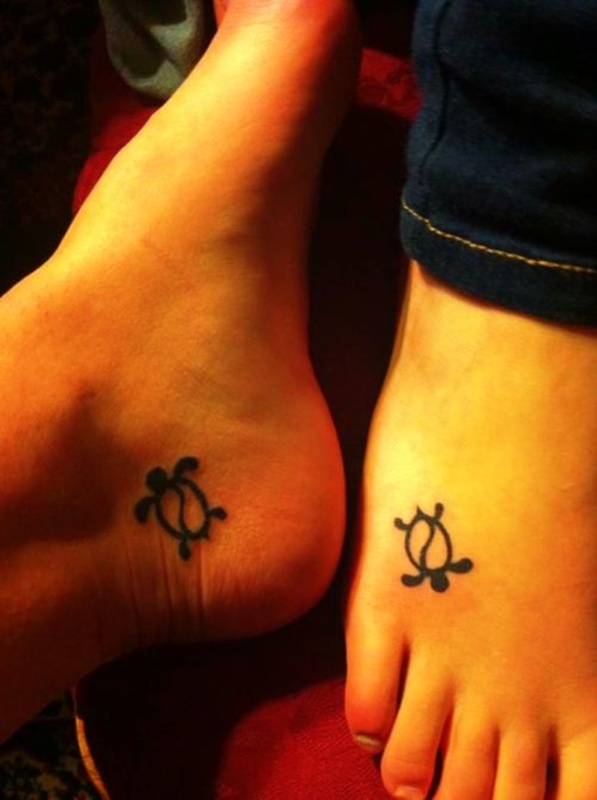 Two sea turtles are depicted on the wearer’s feet. 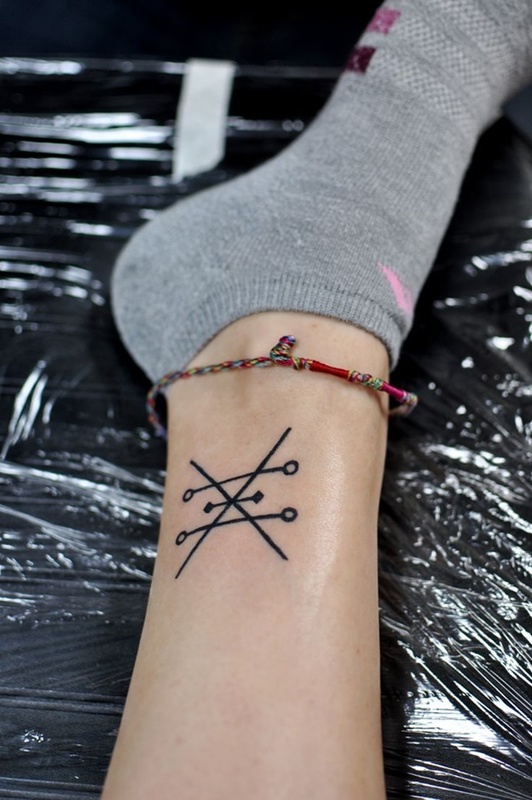 The style of the symbols is very reminiscent of the simple drawings utilized for communication by the Aztecs. 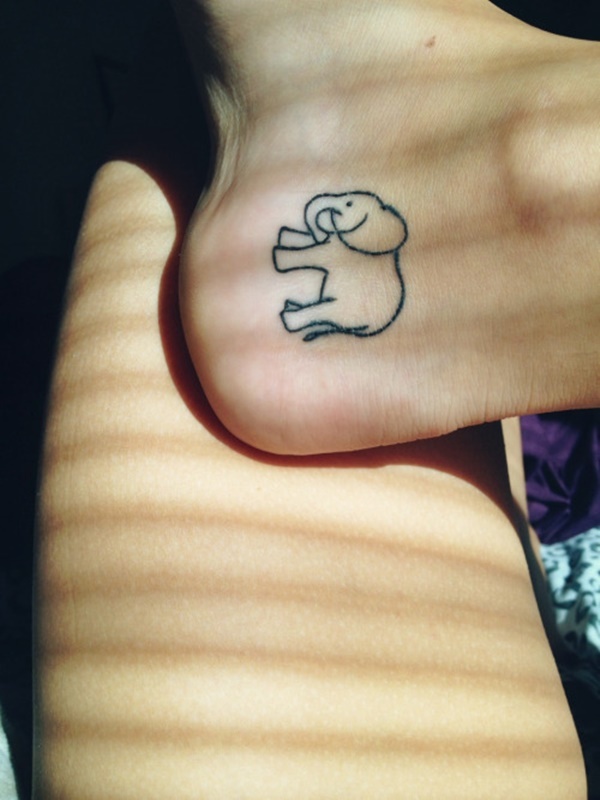 A black outline composes an elephant in this simplified tattoo. 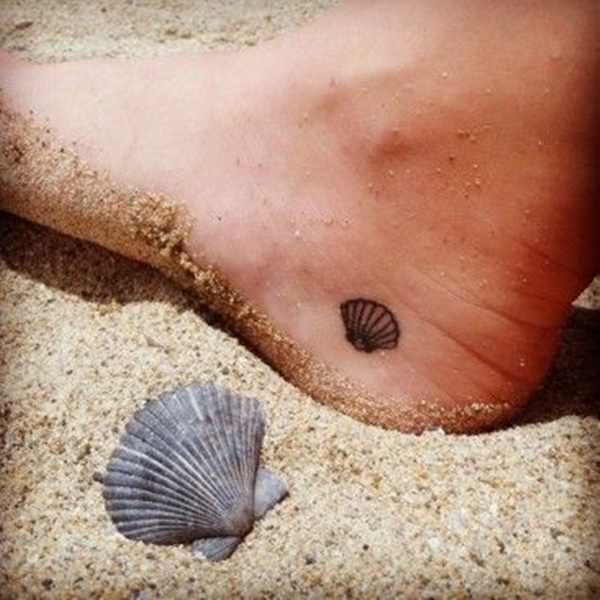 A small shell is depicted with a bold, black outline in front of the wearers heel. 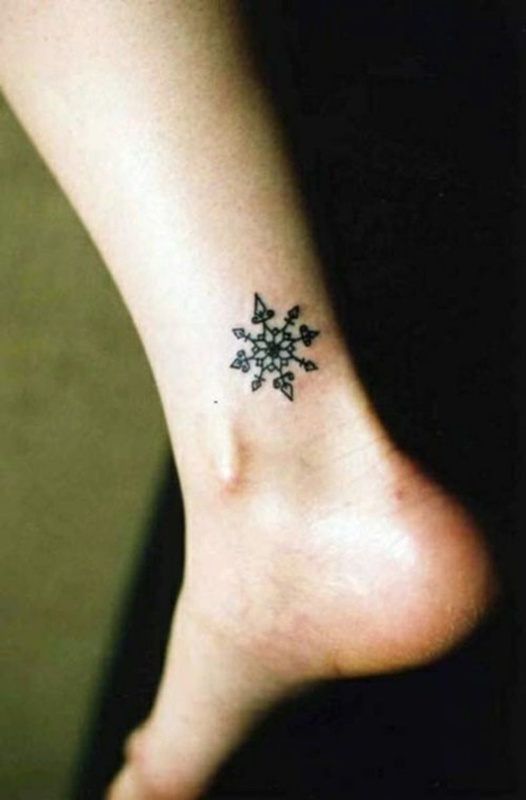 An ornate snowflake is comprised of elements taken from mandala patterns. I love coffee, but not nearly as much as this wearer does. 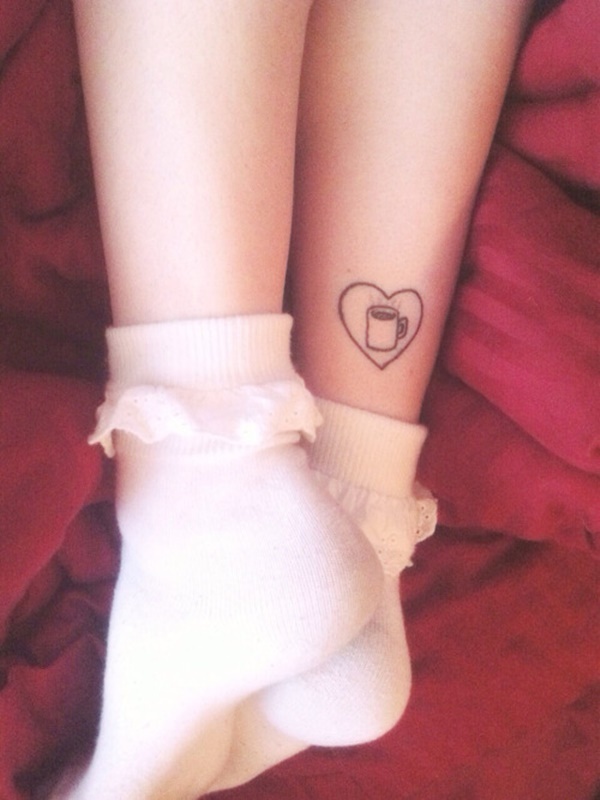 A heart frames a steaming mug of hot coffee. Once again we see an ode to the Talaria of Greek mythology. 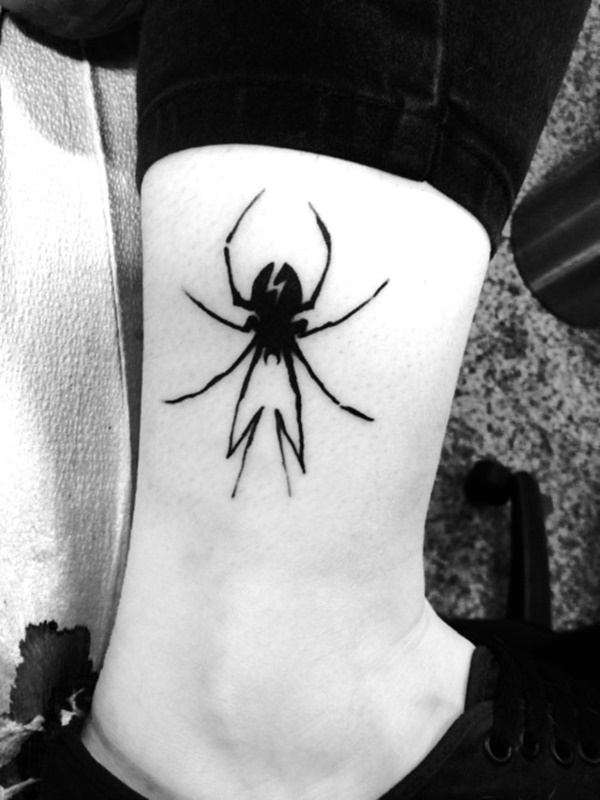 A long legged spider creeps down the wearers shin. A lightning bolt accents the spider’s abdomen in the same place black widows have their markings. In the late 90s and early 2000s the yin-yang was an unavoidable pop culture symbol. 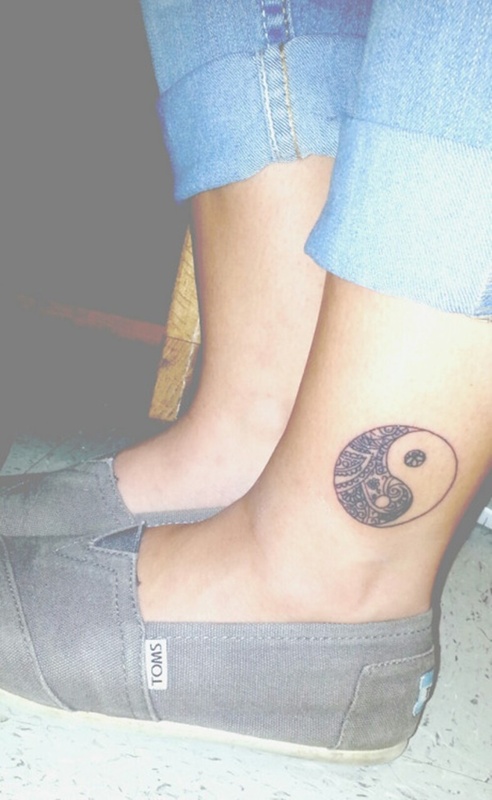 While a yin-yang is typically black and white, this tattoo has replaced the black side with a paisley pattern. 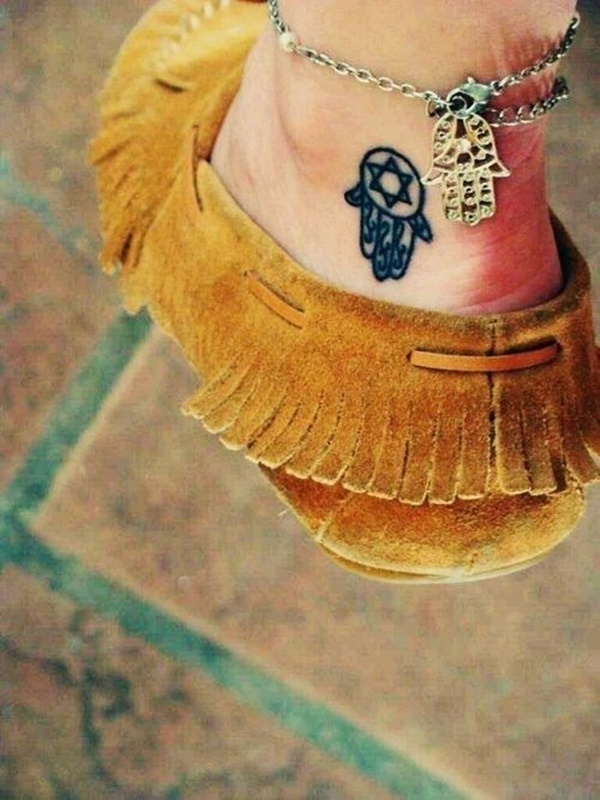 This tattoo utilizes black outlines and Jewish symbolism to depict a Hamsa hand adorned with the Star of David. 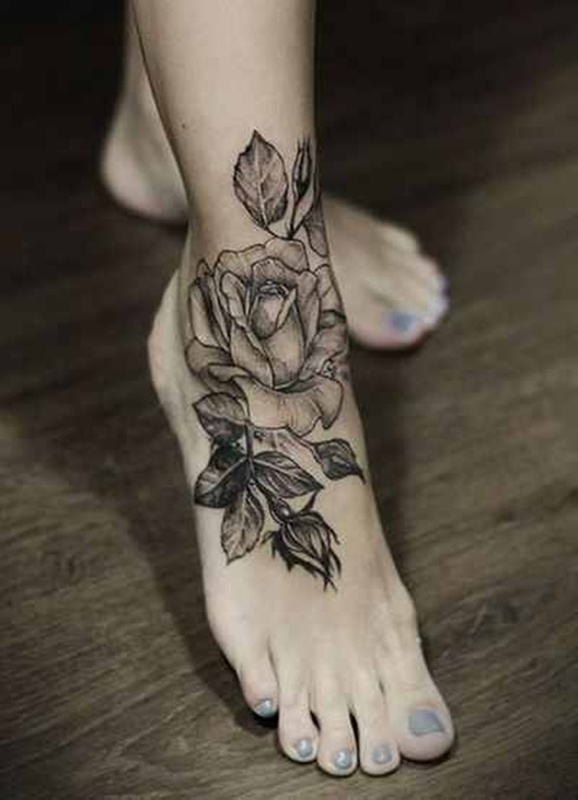 Impeccable shading creates the detail in the leaves and petals of this rose. 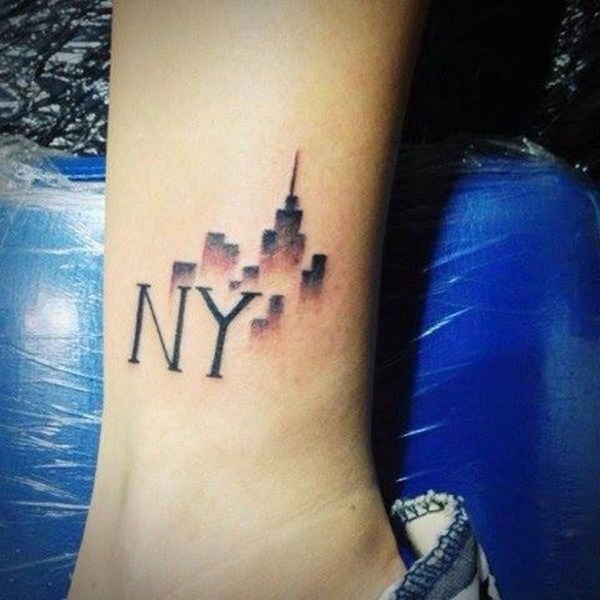 This tattoo professes the wearers love for New York. A skyline shows the silhouette of the Empire state building next to the letters NY. Cue the techno music. 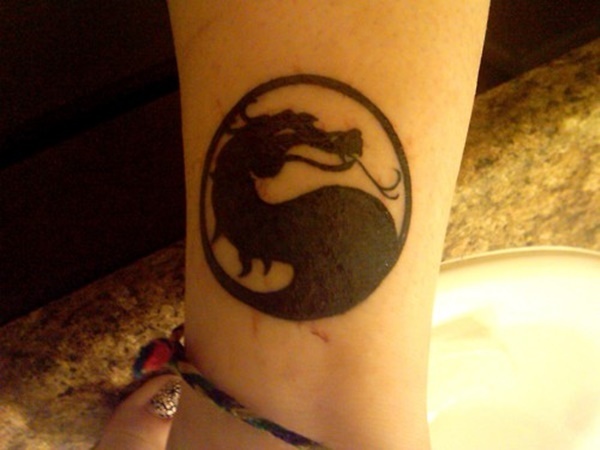 This tattoo shows the symbol for the infamous fighting game Mortal Kombat. 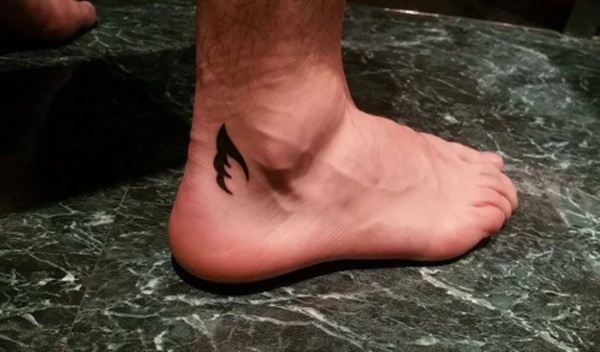 While the concept of the tattoo is simple the execution is sub-par. The petals at the bottom of the piece are obviously asymmetrical. 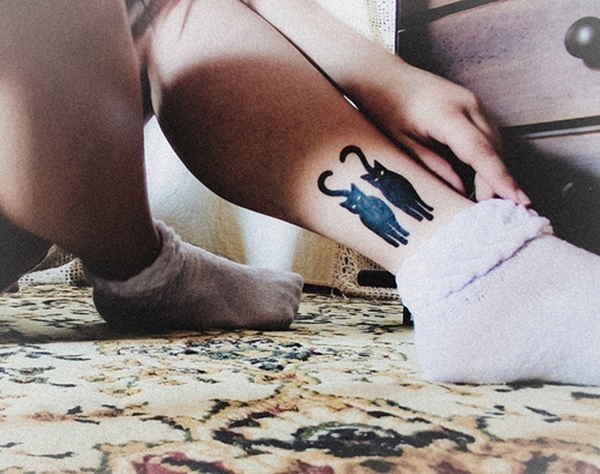 This tattoo depicts the backside of a cat, a simple and boring concept to profess your love of felines. A small picture of an umbrella. Oddly enough it only seems to be raining directly underneath the umbrella. 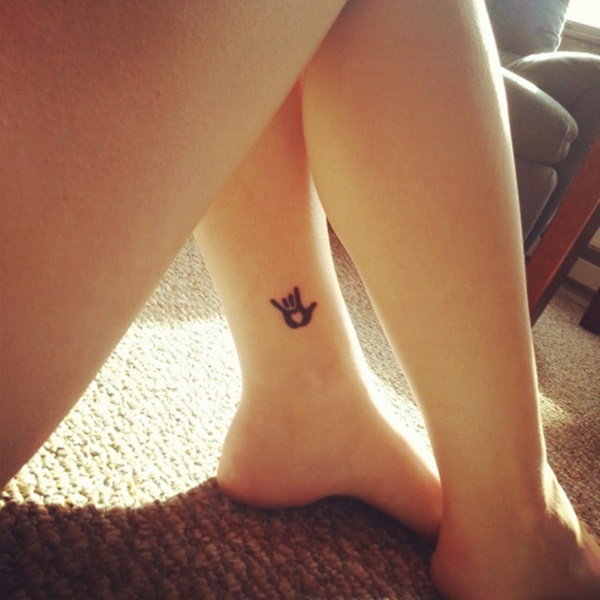 Pay attention to details when you’re conceptualizing a tattoo. A squat bird with a bright red belly adorns the shin of the wearer. 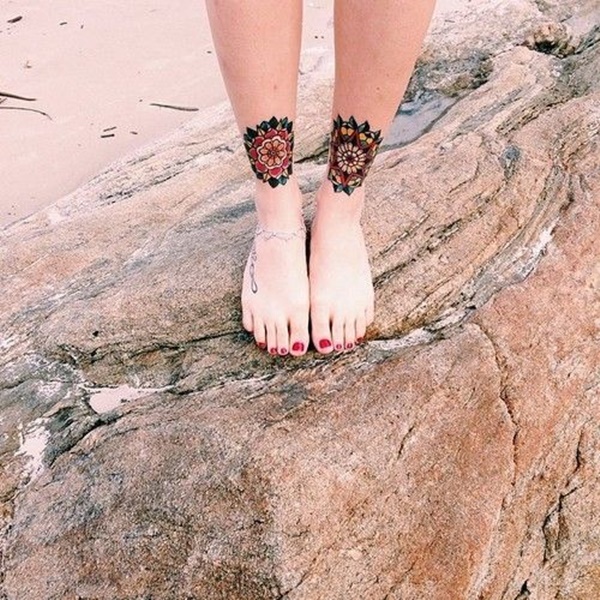 A patterned band utilizing geometric shapes and pointillism wraps around the wearer’s ankle. 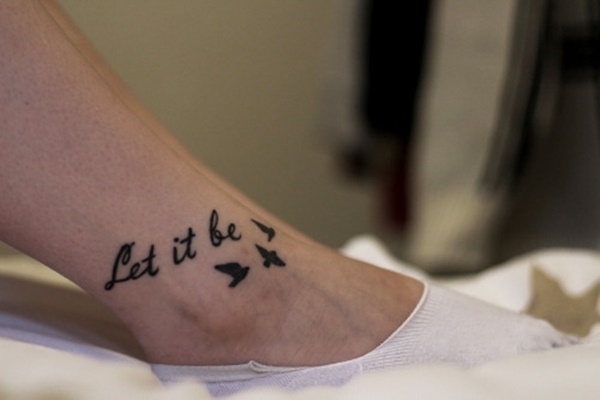 The silhouette of three flying birds are depicted underneath the phrase “Let it Be”; the title of a famous Beatles song. 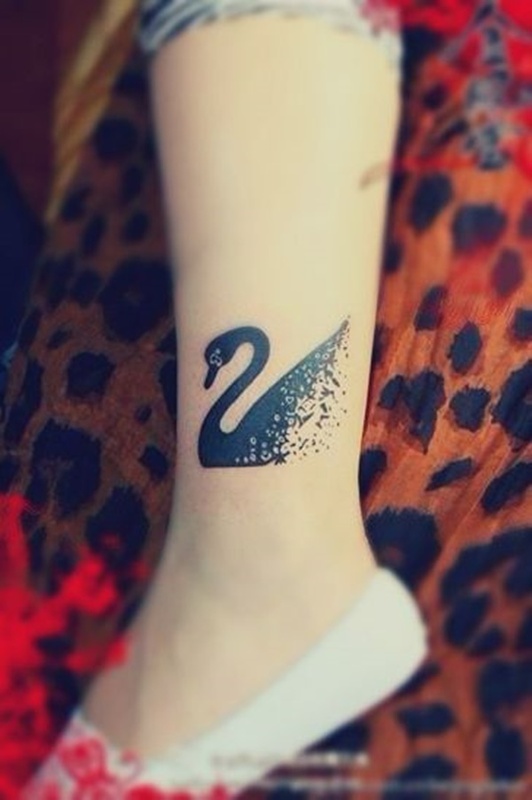 Black swans are synonymous with the story of the ugly duckling. Here we see a portrayal of a black swan de-materializing. The thunderbird and stags are prevalent creatures in Native American mythology. 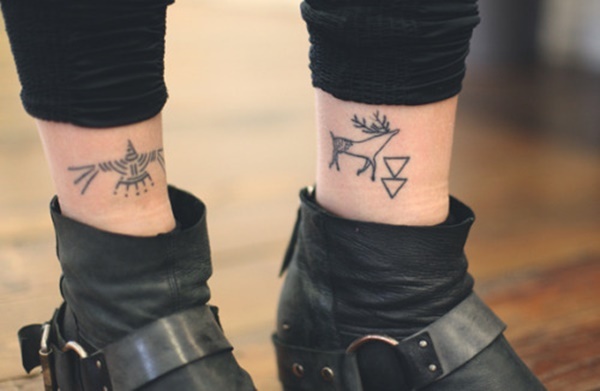 Here we see both animals represented in a style that pays tribute to the traditional Native American depictions. 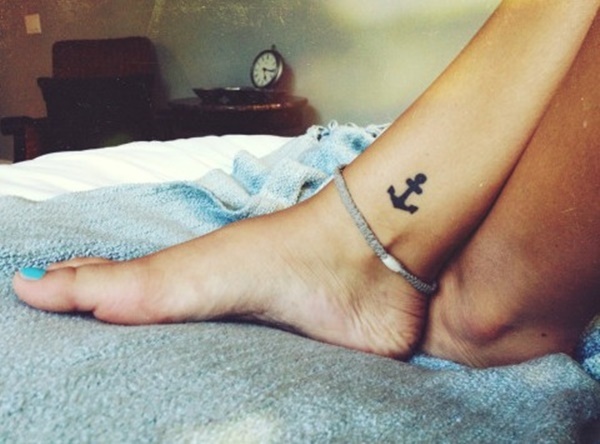 A black silhouette of an anchor sits just above the wearer’s ankle bone. An example of a good concept with poor execution. 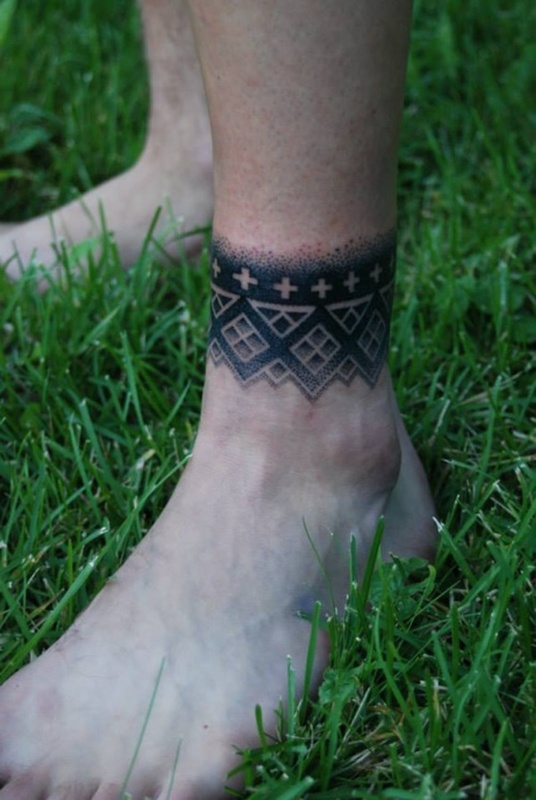 The tattoo imitates a piece of Native American jewelry but the line work and coloration are sloppy. 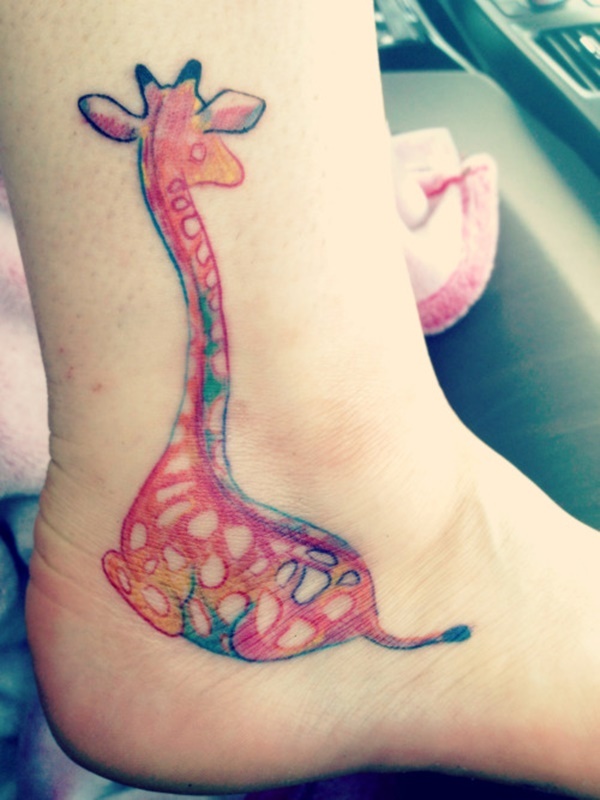 An exceptionally colorful giraffe wraps around the wearer’s ankle bone. 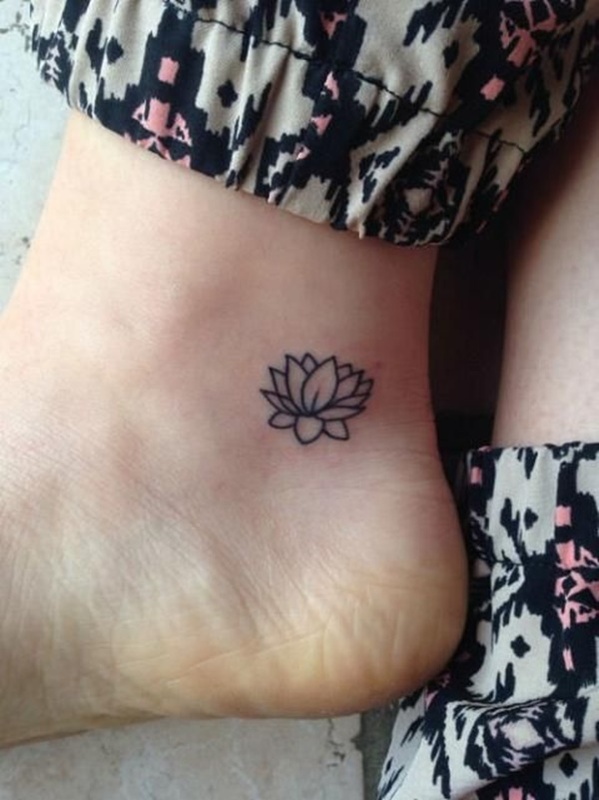 A simple side view of a lotus atop a scrolled line. Alive is written in script and is accented by lines extending from both sides of the word. 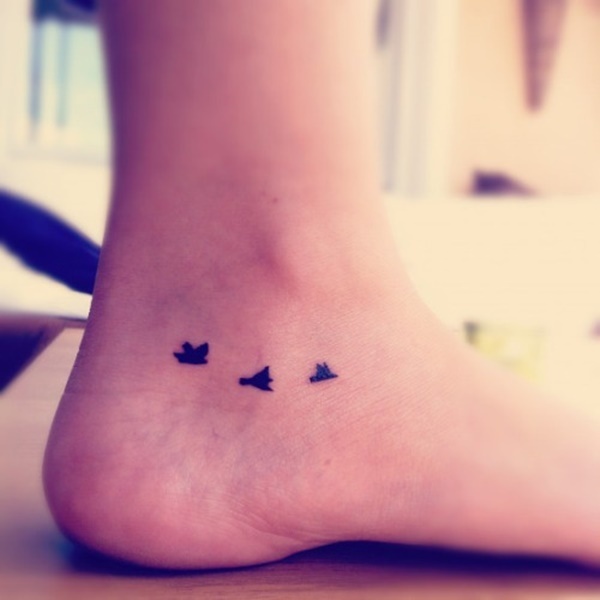 Two black and grey sparrows adorn the wearer’s foot. 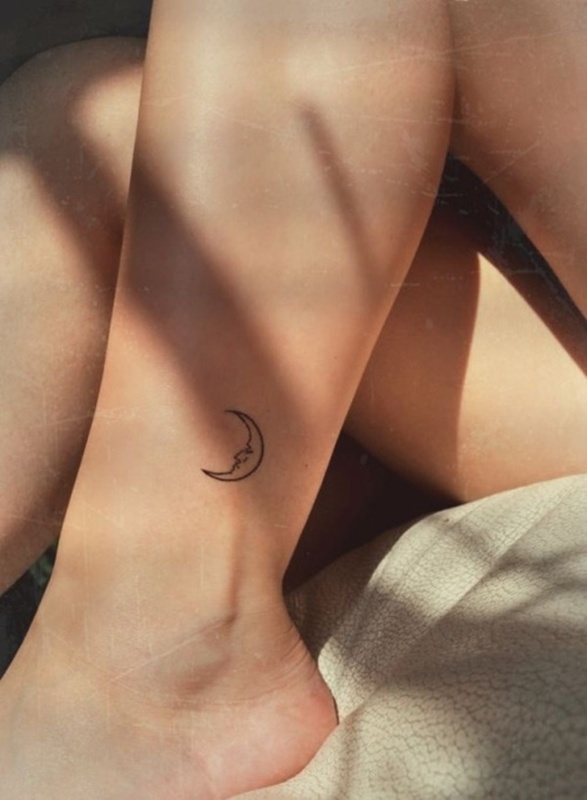 The man on the moon is depicted on a crescent moon in this simple tattoo. 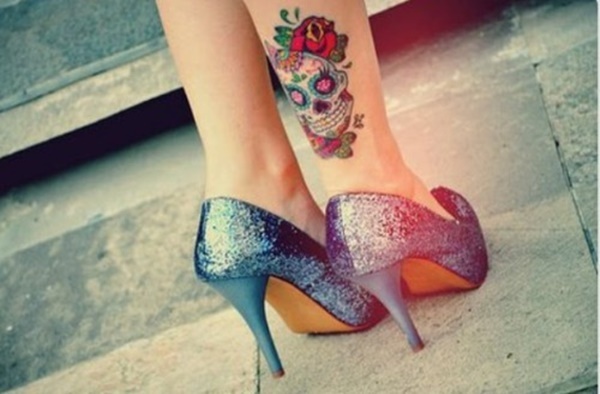 Bows have become a popular tattoo for women and soften traditionally masculine images. 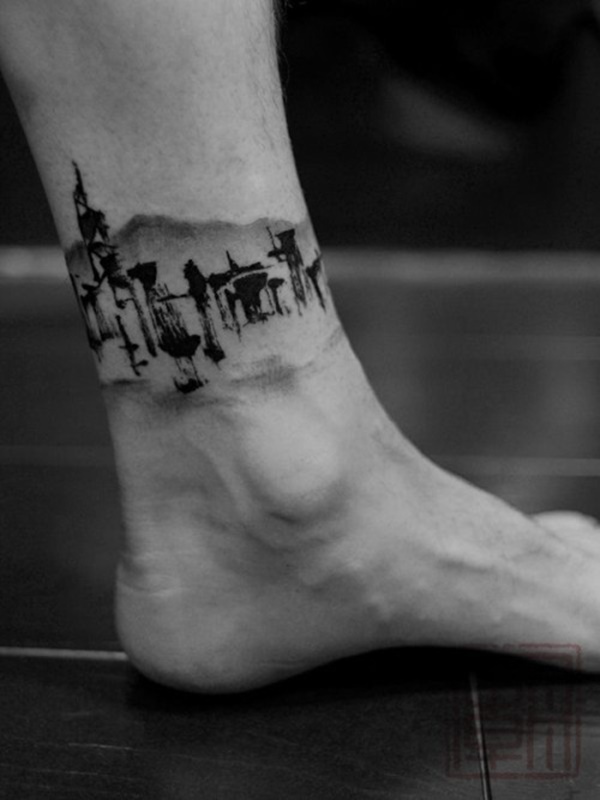 A black and grey portrayal of the Eiffel Tower runs up the side of the wearer’s leg. 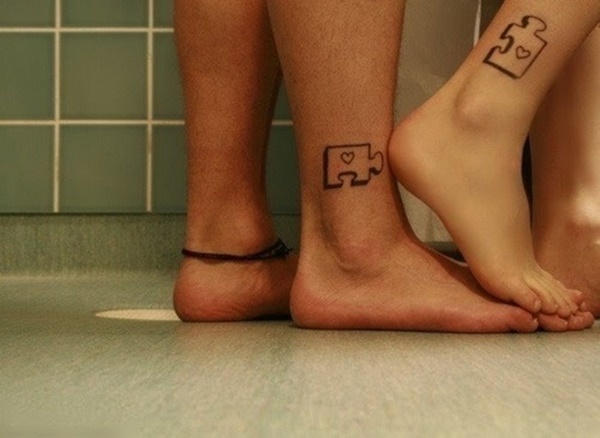 While the idea is cute, when the pieces are put together there is still a need for other pieces to complete the puzzle. 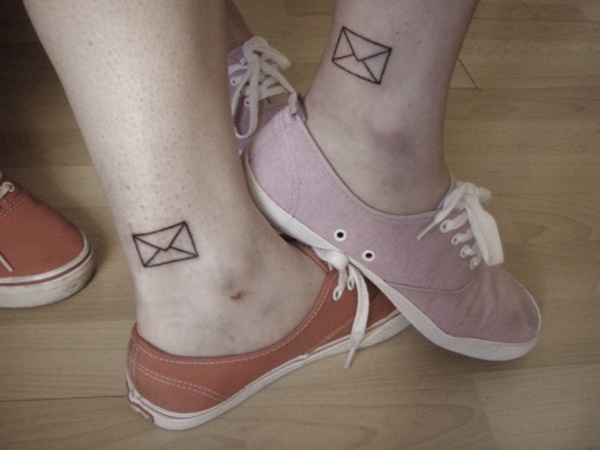 The familiar symbol representing an e-mail is portrayed on the wearer’s ankle. Perfect for someone enamored with electronic correspondence. Scorpions, panthers, and snakes are arguably the most popular animals in tattooing. 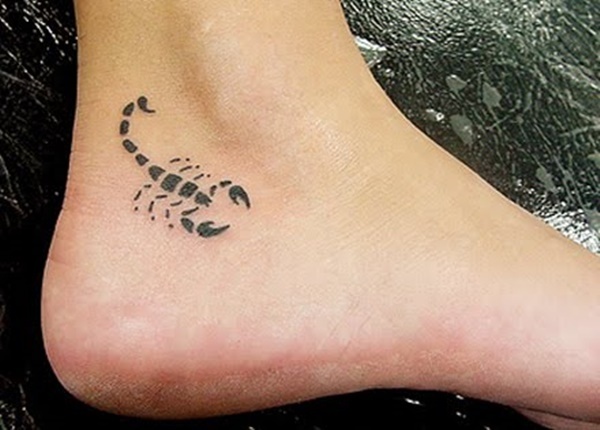 Here we see a black scorpion positioned behind the wearer’s ankle. 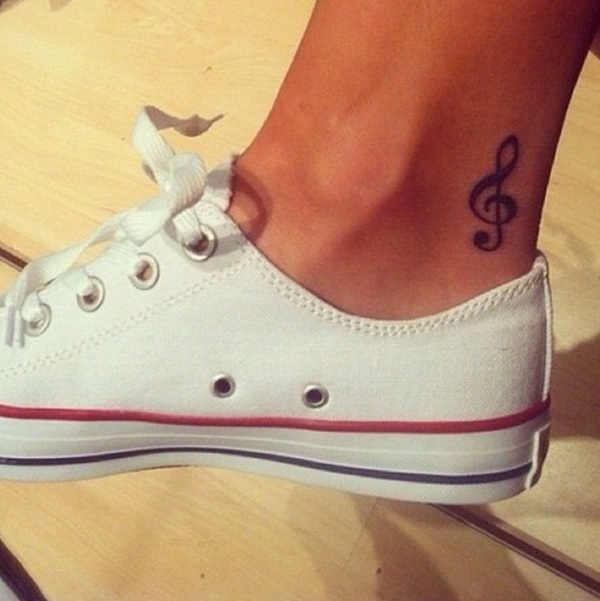 A musical staff sits behind the wearer’s ankle bone. 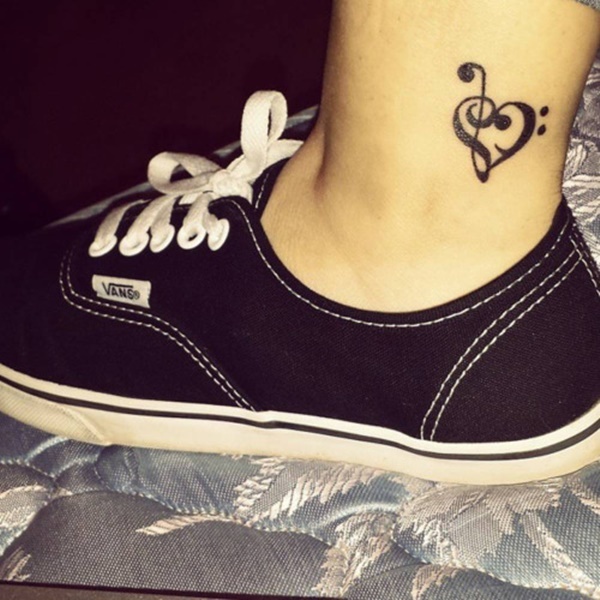 An effective way of communicating that the wearer is a musician. Pikachu is the most popular Pokemon and here we see an exhausted Pikachu resting on his stomach. 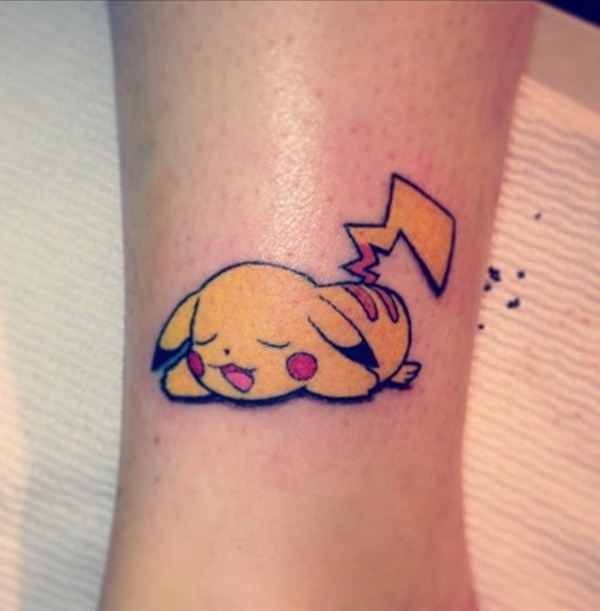 With the Pokemon generation aging Pokemon tattoos are becoming more prevalent. 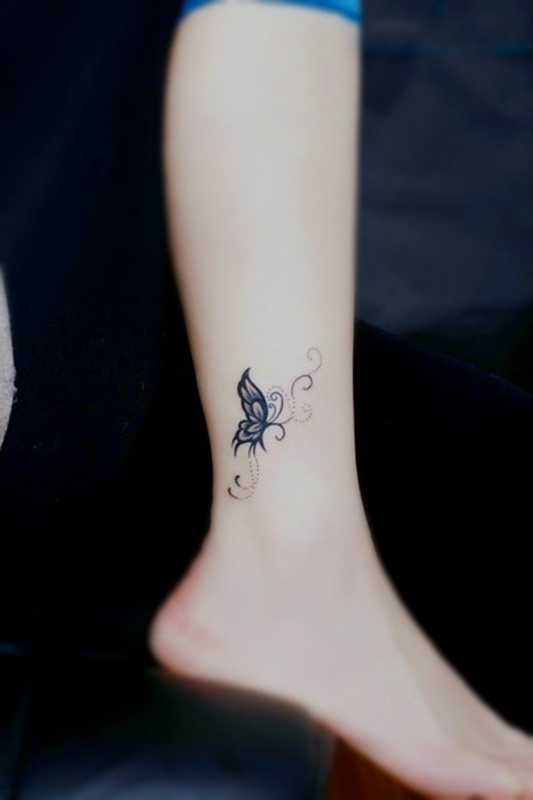 A beautifully detailed butterfly floats above the wearer’s ankle bone. Here we see another anchor, this time accompanied by a chain. This tattoo depicts flowers embellished with microdermal implants. Microdermals are achieved by cutting the flesh, inserting a base, and screwing in the jewel. 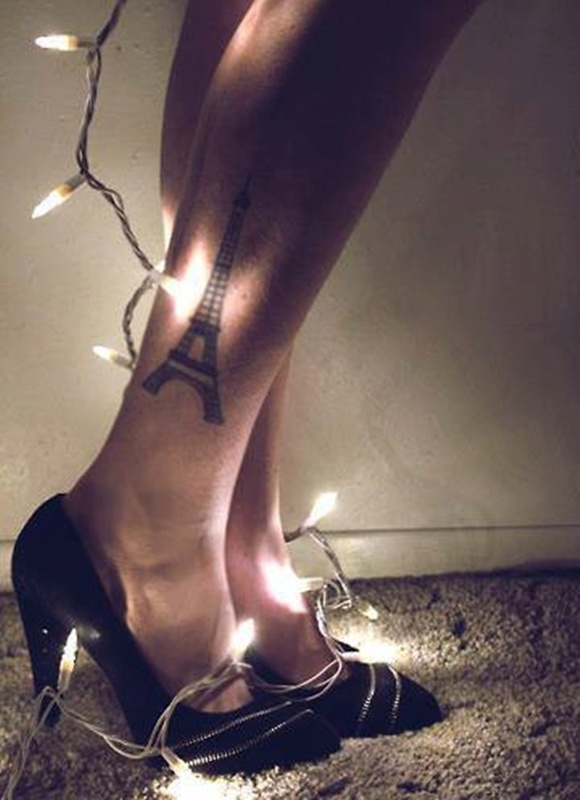 My eye is immediately drawn to the lit candle on the wearer’s left leg and the tape casette on the wearer’s right ankle. 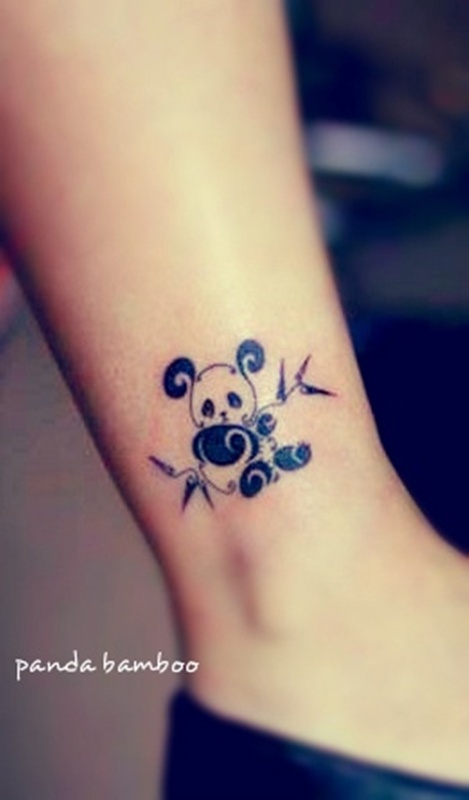 Here we see a stylized baby panda comprised of ornate scrolls. This has to be one of the most ridiculously stupid tattoos I’ve ever seen. 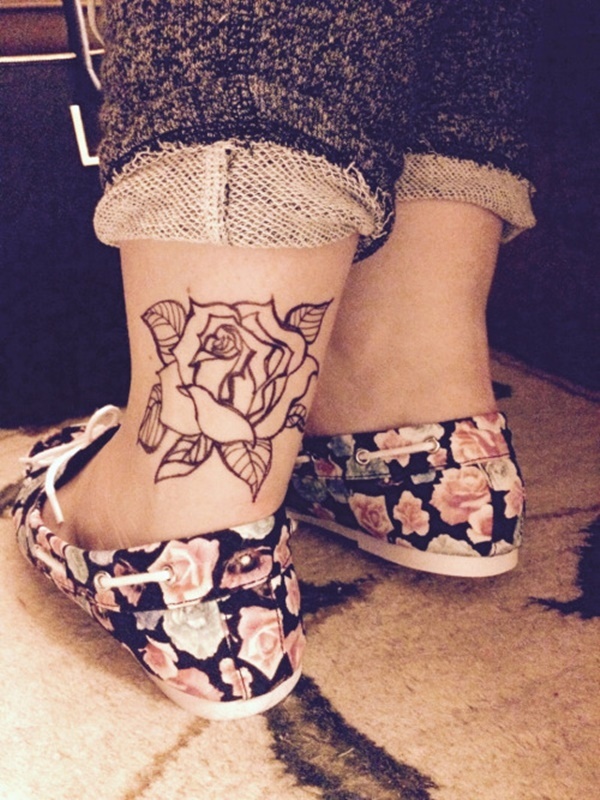 Don’t waste your money, time, and space on a tattoo that perpetuates a moronic fad. 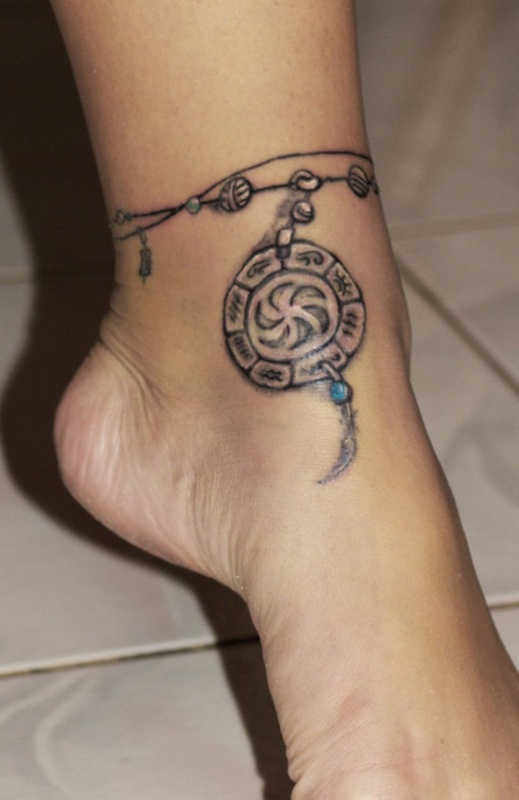 A black and grey anklet decorated with two feathers is well represented using shading techniques. 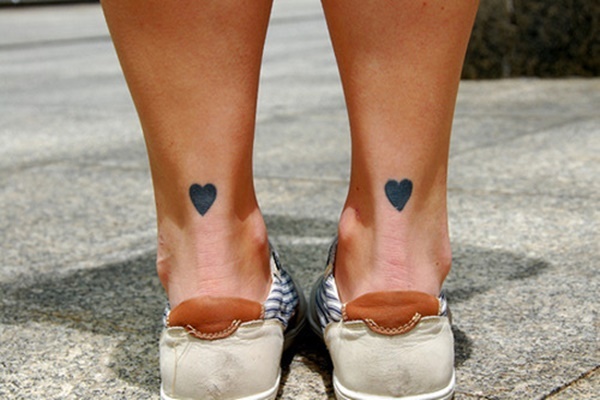 Simple, subtle, completely black hearts are displayed on the heels of the wearer. 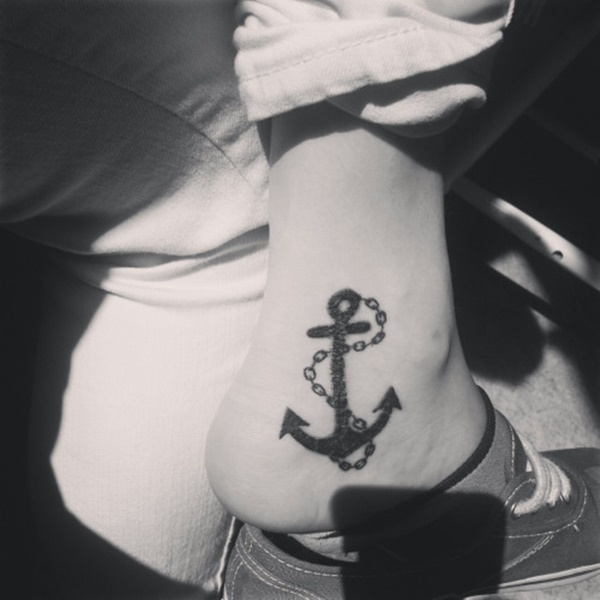 A black anchor is accented with a heart at the top. Despite the traditional association of black cats with bad luck. 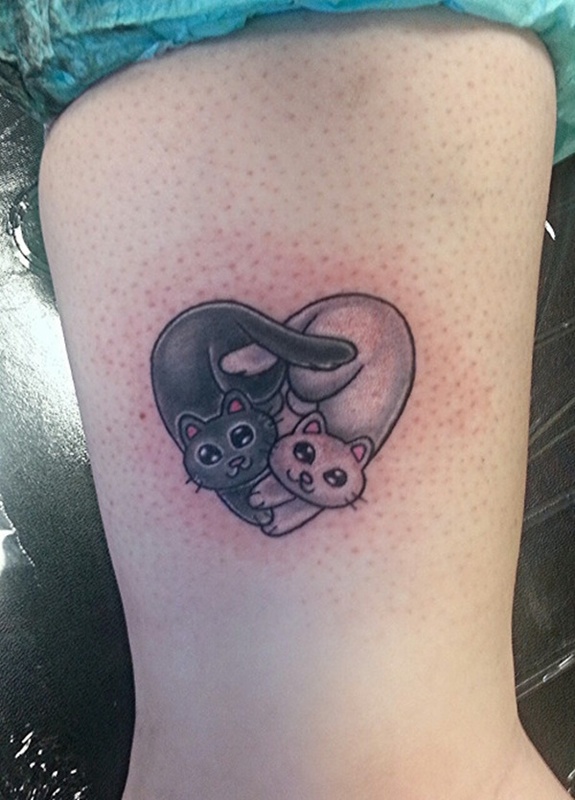 This wearer has tattooed two black cats on her ankle with the tails of the animals forming the shape of a heart. 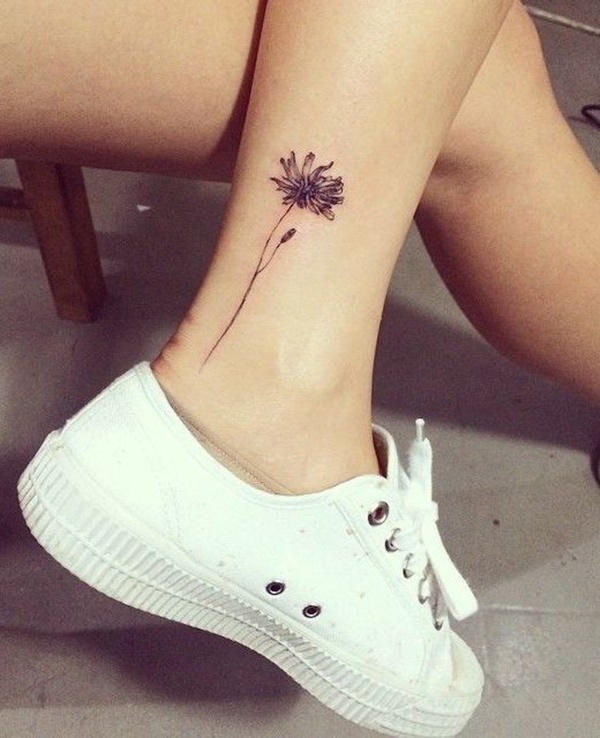 A flower is shaded with dots and has three arrows pierced through the bulb. 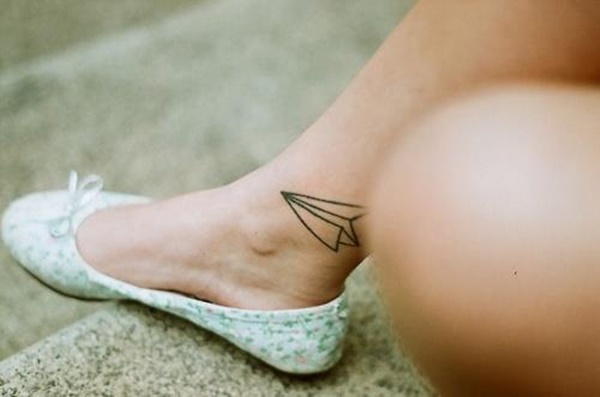 On the left ankle we see an envelope sealed with a heart. 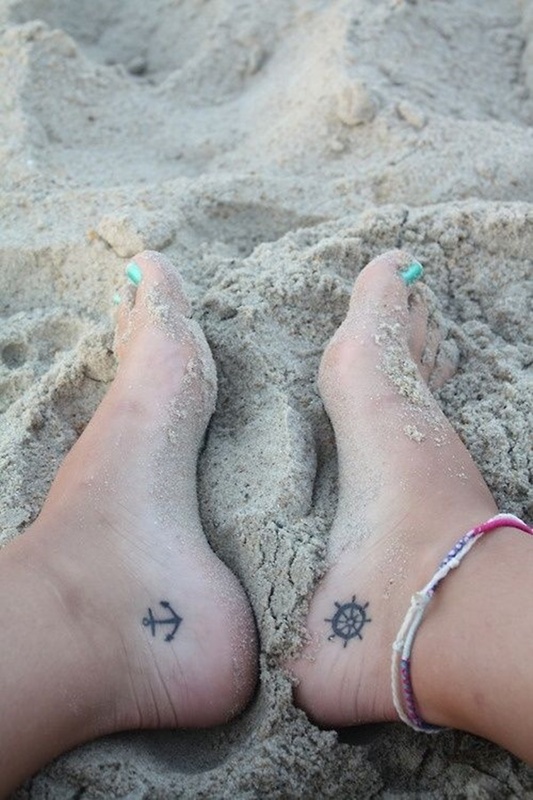 On the right ankle we see a key with a three on the handle. Two bows are tied around the ankles of this wearer. Notice the use of white ink and coloring that gives the effect of the bows reflecting light. A simple feathered anklet with a dark black embellishment where the feather meets the anklet. 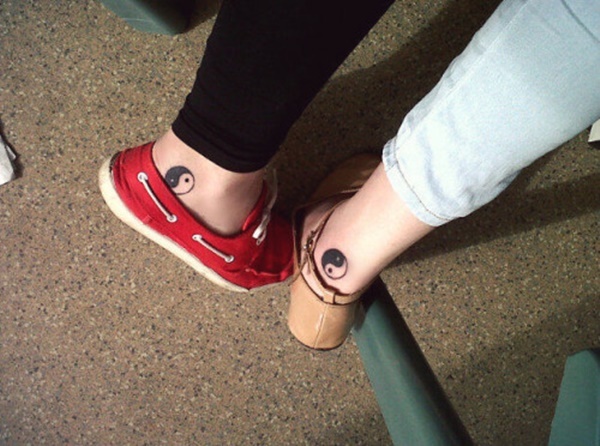 A pair of friends exhibiting their matching tattoos depicting a traditional yin-yang symbol. 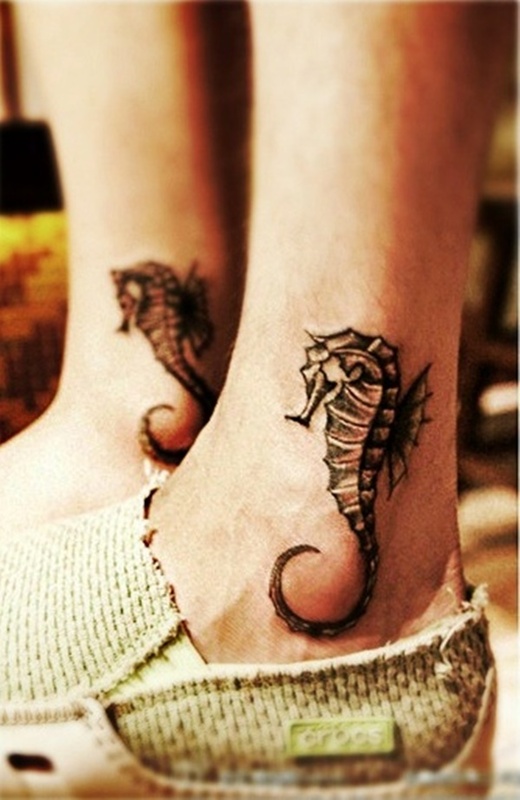 A pair of matching sea horses adorns the ankles of the wearer. The animals are well drawn and shaded but I question why the creatures have no eyes. 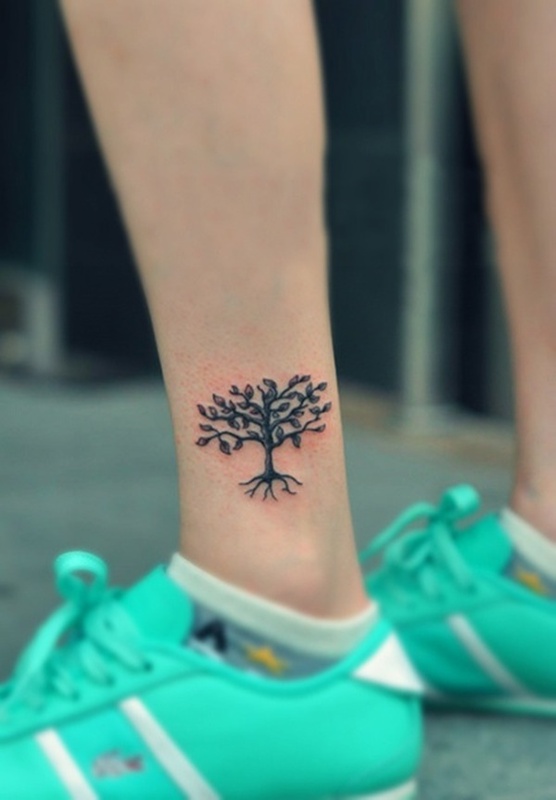 The silhouette of a tree is placed just above the wearer’s ankle bone. 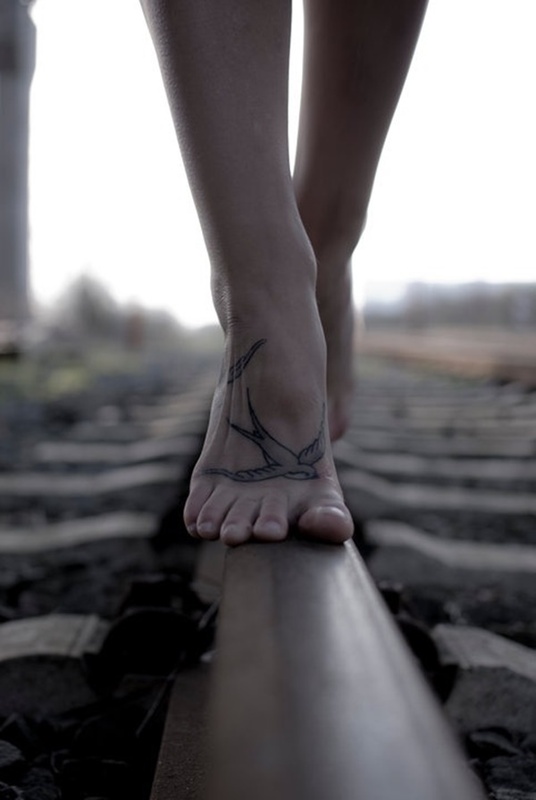 The back view of a black and grey sparrow swooping beneath the wearer’s ankle bone. 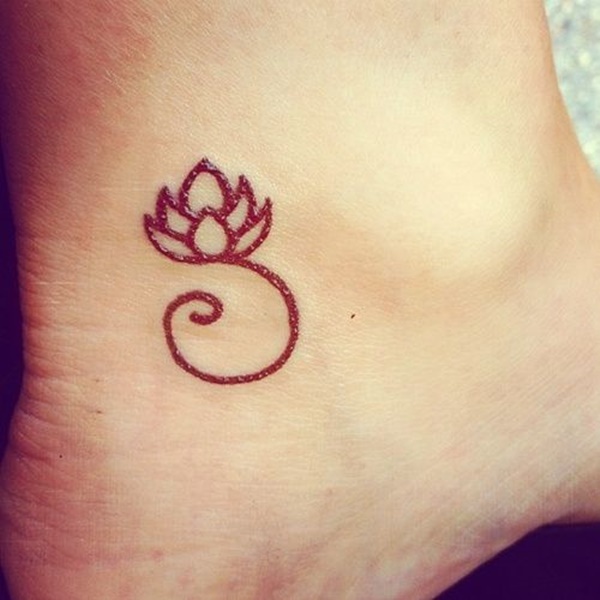 When tattooing a silhouette emphasis should be put on the shape of the image. Here we see what is supposed to be the silhouette of three birds flying, however, because the outlines were sloppy the images look awkwardly proportioned. 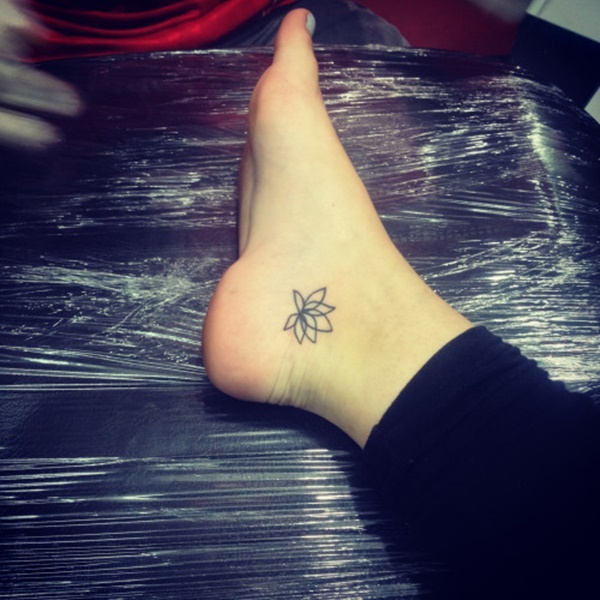 Black outlines compose the side view of a lotus flower in this tattoo sported behind the wearer’s ankle bone. 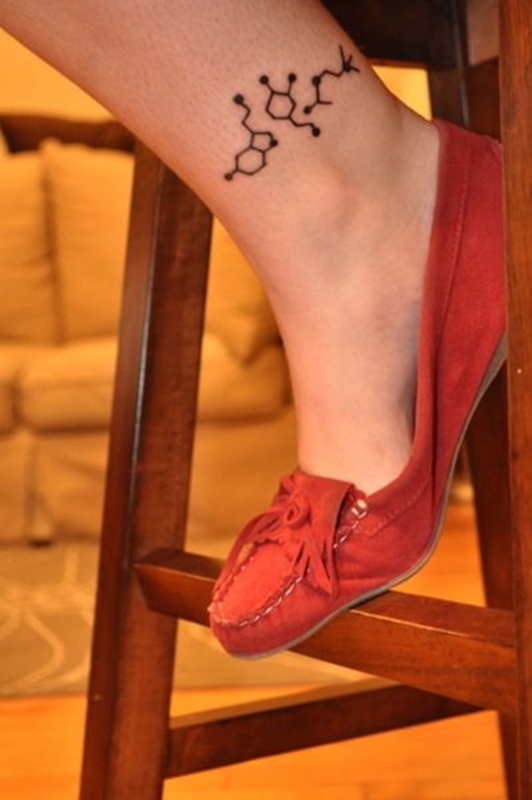 This tattoo portrays a chemical composition. 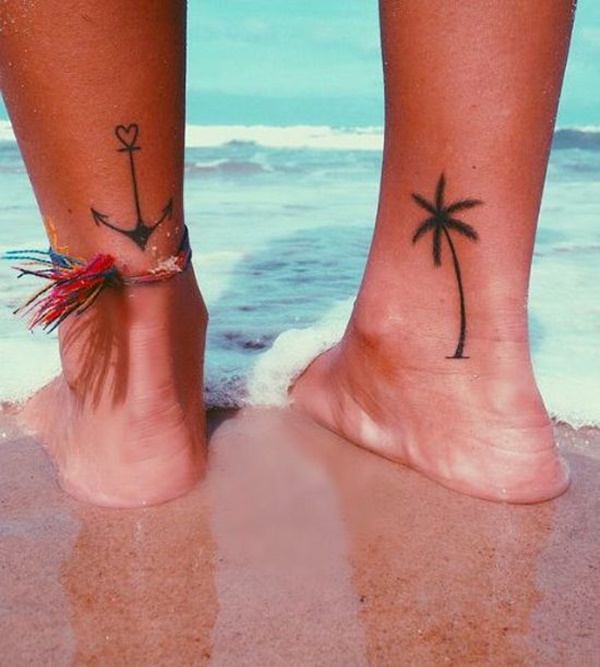 An anchor and palm tree are coupled on the back of this wearer’s legs. 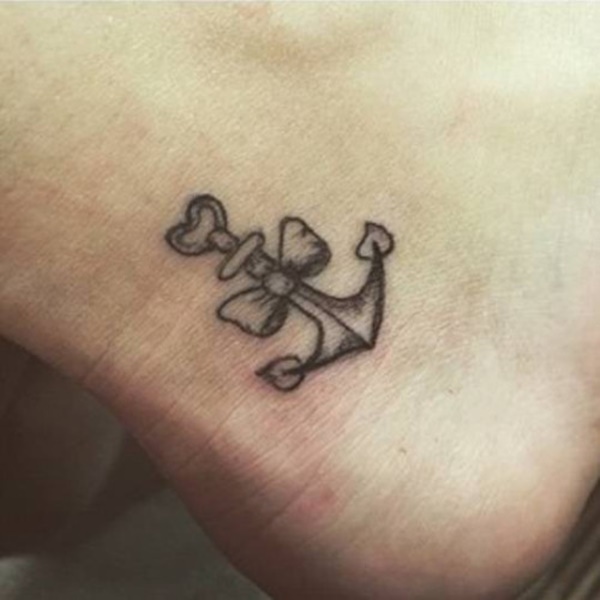 Both images are silhouettes with the anchor using a heart to enclose the top loop. Sticking to a nautical theme this wearer decided to portray an anchor on one foot and a ships steering wheel on the other. 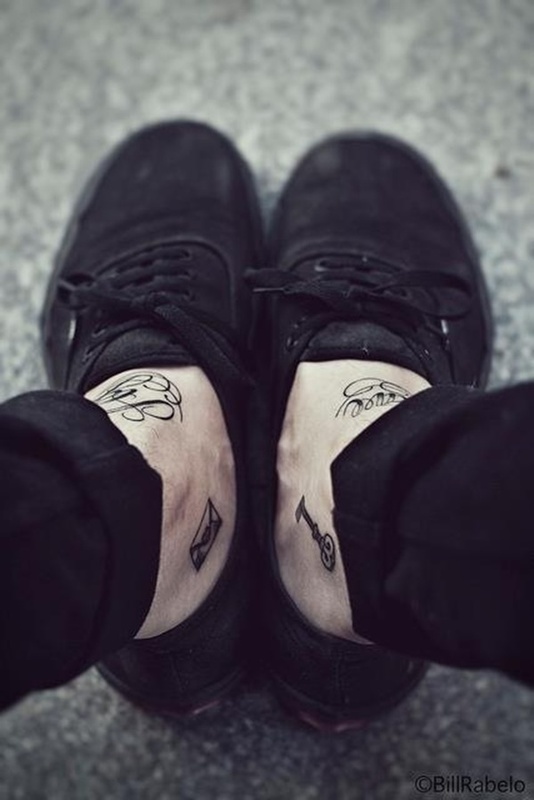 Both images are placed beneath the wearer’s ankle bone and just in front of the wearer’s heel. The rosary is used for prayers in the Catholic religion. 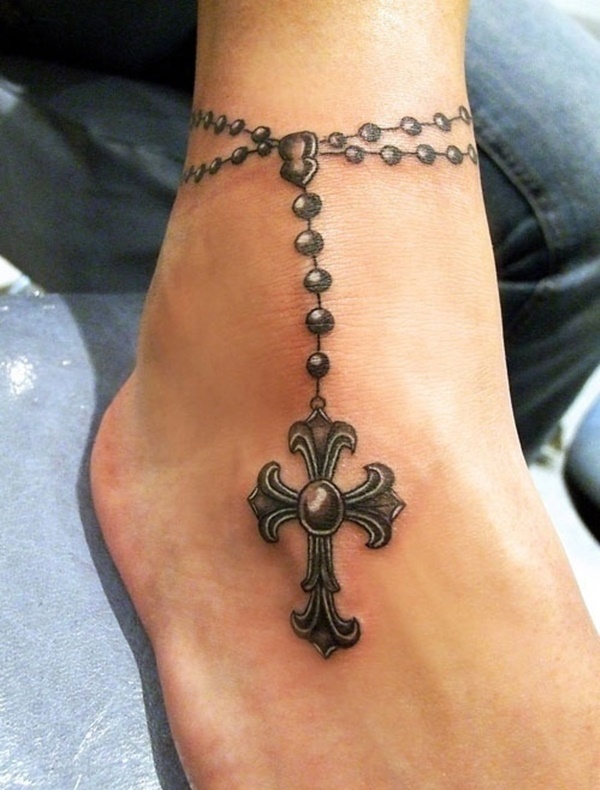 Here we see a rosary wrapped around the wearer’s ankle, the beads and the ornate cross are shaded to give the impression of reflecting light. While these minimalist black bands are a set the wearer split one piece into two black bands to create some diversity in his tattoos. 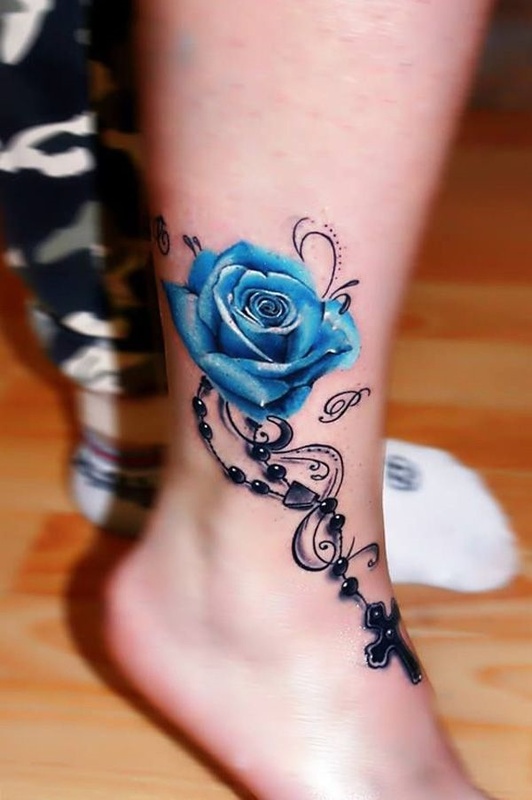 This is a gorgeous tattoo depicting a blue rose and a black rosary. The rose is colored with a vibrant blue and the rosary gives the impression of glossy black. The piece is embellished with a few scrolled lines and a set of initials. 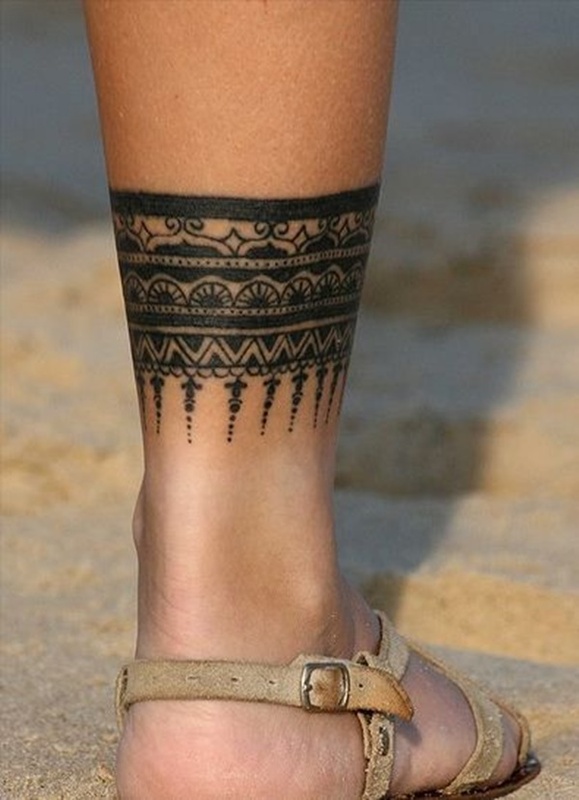 An anklet frames and the pattern before the wearer’s toes frame an elaborate mandala. 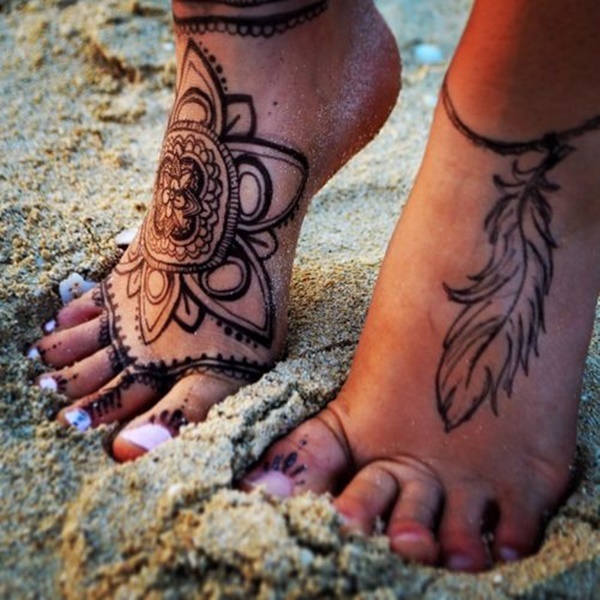 The anklet on the wearer’s left foot sports a highly detailed feather. This pieces are beautiful examples of pattern work. I have no idea what this is beyond a series of lines capped with circles and an X. 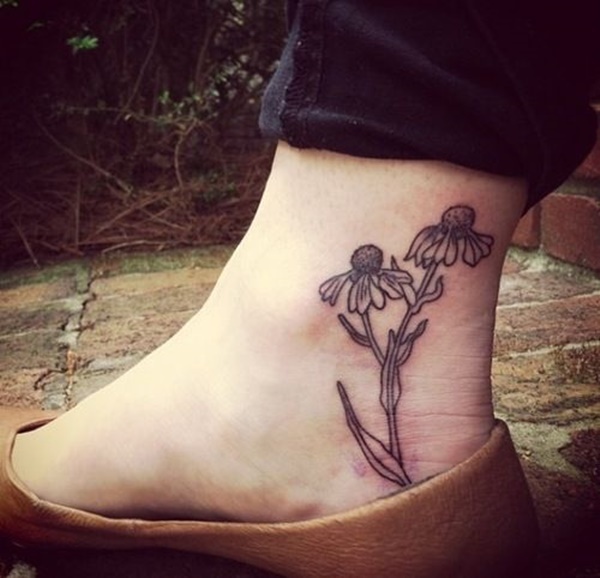 A flower with wilted petals and a wispy stem sprouts behind this wearer’s ankle. Pink Floyd’s Dark Side of the Moon is an iconic album in music and rock and roll history. 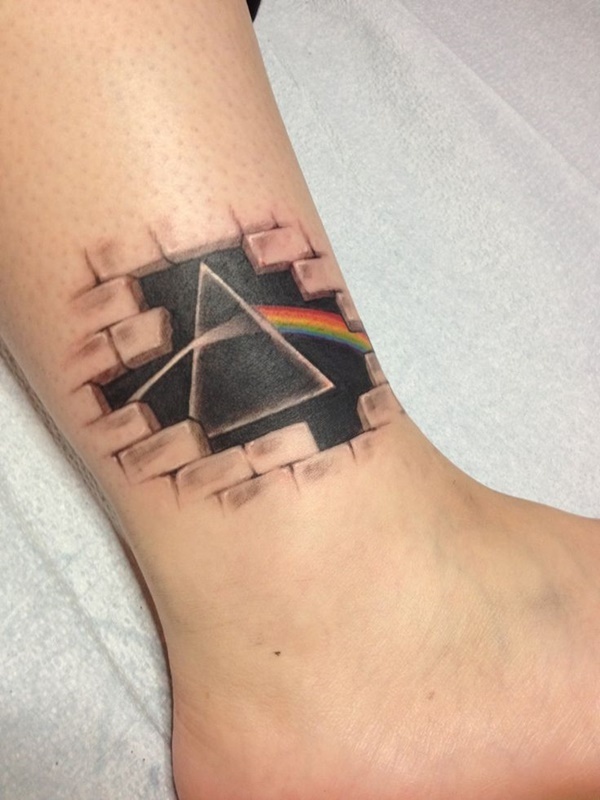 This tattoo pays homage to Pink Floyd’s hit song “Another Brick in the Wall” by depicting the logo for Dark Side of the Moon behind a few removed bricks. The logo is a light spectrum converting the white light into the colors of the rainbow. This elaborate shin piece displays a fragmented image including a man, a record, a quote, and a few reverse silhouettes of birds. 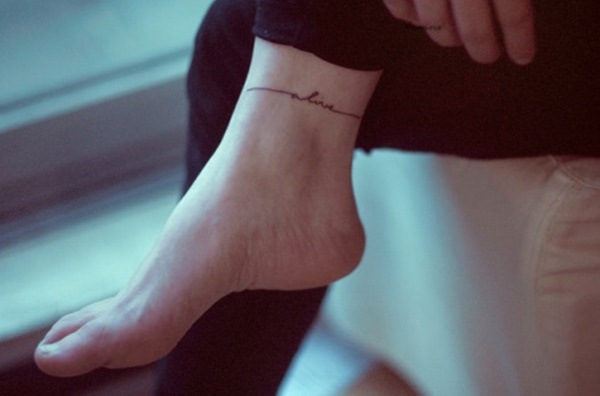 The quote “I’d rather be hated for who I am, than loved for who I am not” is placed at 1/4 length intervals throughout the tattoo. 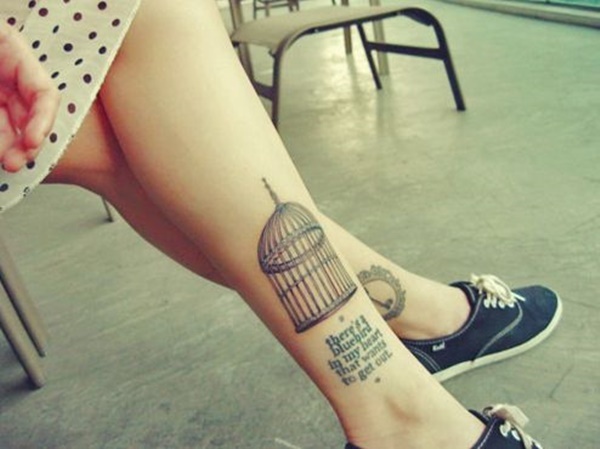 “There’s a bluebird in my heart that wants to get out.” Is quoted underneath an empty cylindrical bird cage. I can understand why the image of a cage is associated with a bird, but if the bird wants to get out shouldn’t it be trapped inside of the cage? In addition, if the cage is to represent the wearer’s heart wouldn’t it suffice to make the cage reminiscent of a heart? 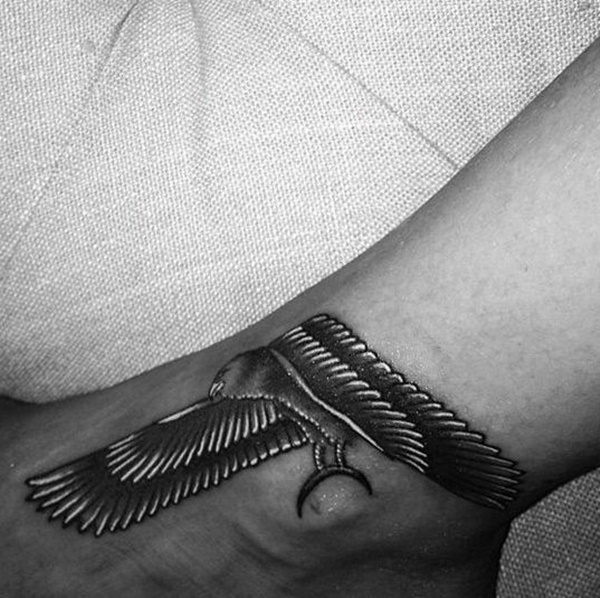 An eagle depicted in a traditional style and coloration is awkwardly positioned around the wearer’s ankle bone. The feet are unnatural and the white ink accents seem gratuitous. I’m not sure what this squiggly line is supposed to represent, but maybe that’s the point. The observer is supposed to create an image using their imagination like children staring at clouds. 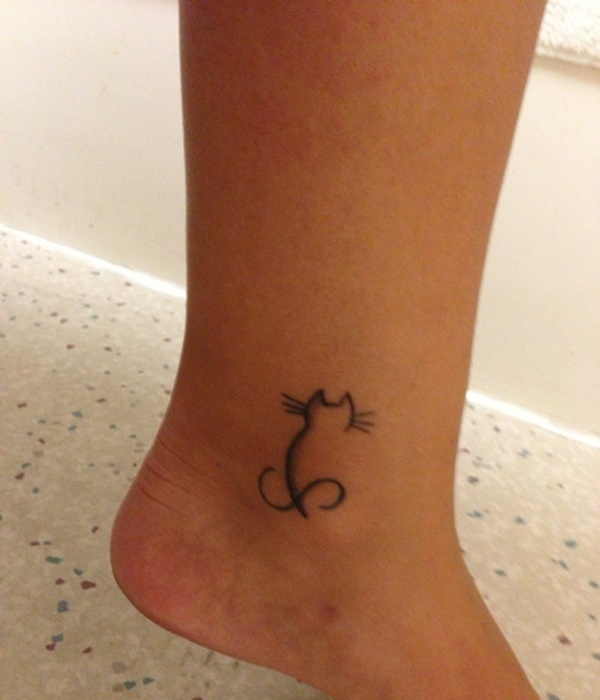 Either that, or the tattoo artist went into a seizure while trying to tattoo an infinity symbol. 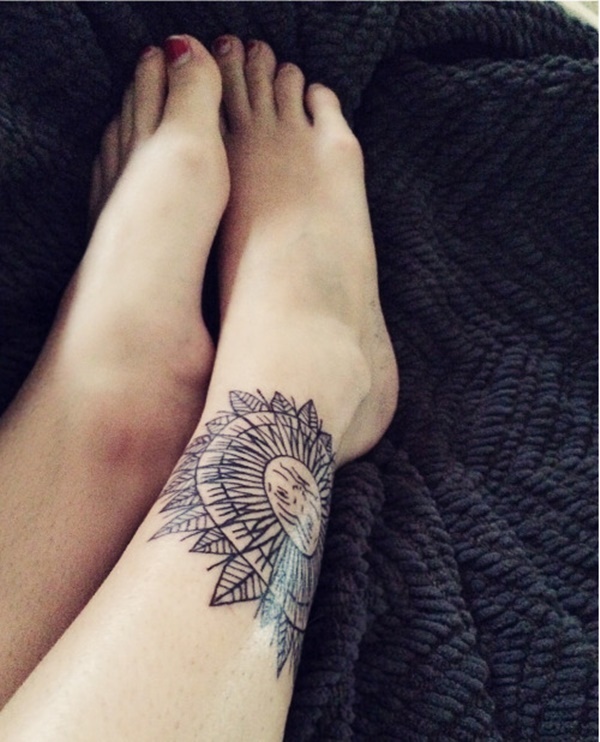 An intricate mandala pattern decorates this simple band tattoo. Small series of geometric shapes drape down from the banded section that includes scrolls, circles, and triangles to create the pattern. 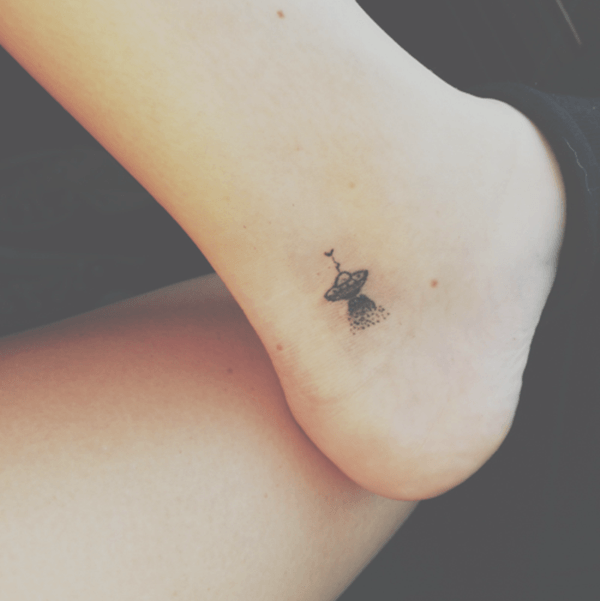 This tattoo poorly renders a stereotypically shaped space ship emitting a a ray comprised of a series of black dots. The line and dot work is sloppy and looks very amateur. I also wonder why a superior race capable of space travel doesn’t have the technology to straighten their ships antenna. 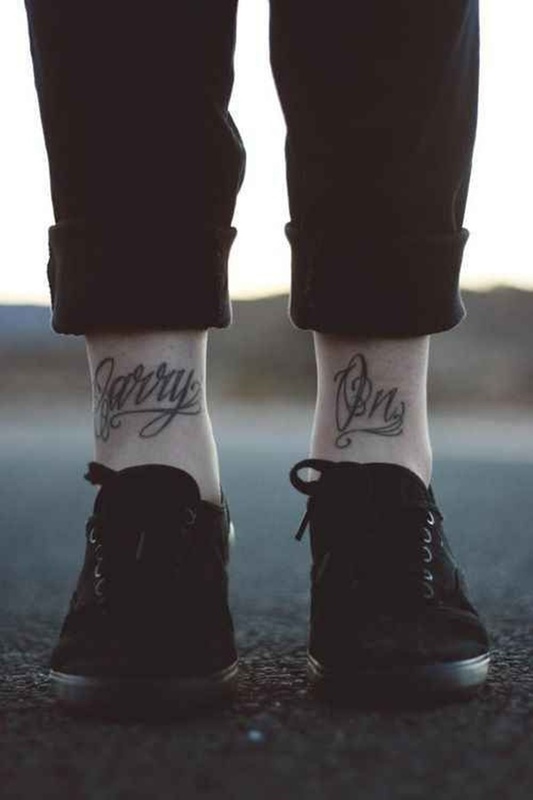 “Carry On” is quoted across the front of the wearer’s ankles in an elaborate black and grey script that utilizes shading and contrast to create the image. Let us know what you think, good and bad, in the comments section.